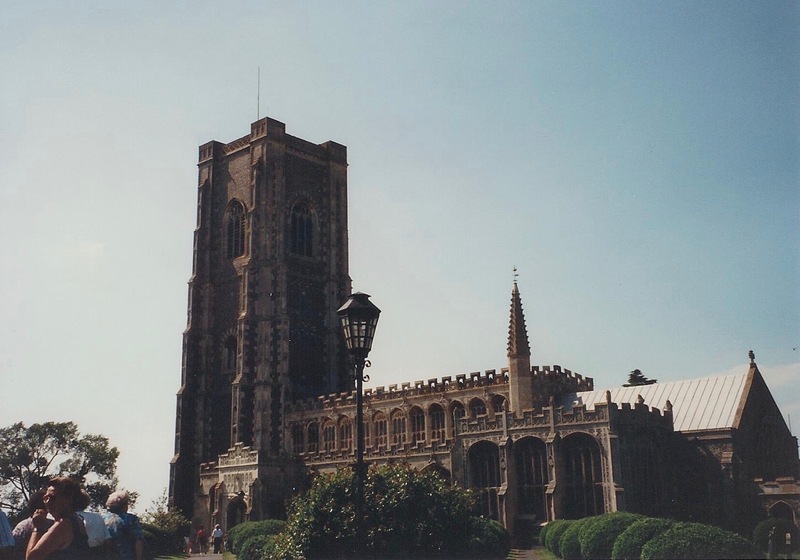 In the town of Bury St. Edmunds in England, the Abbey buildings have been crumbling for centuries. 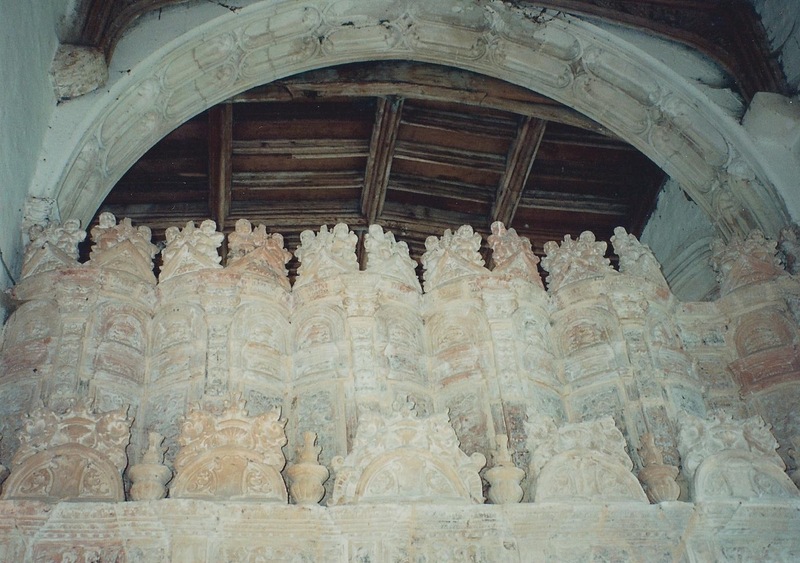 From the original stone buildings, ruins. 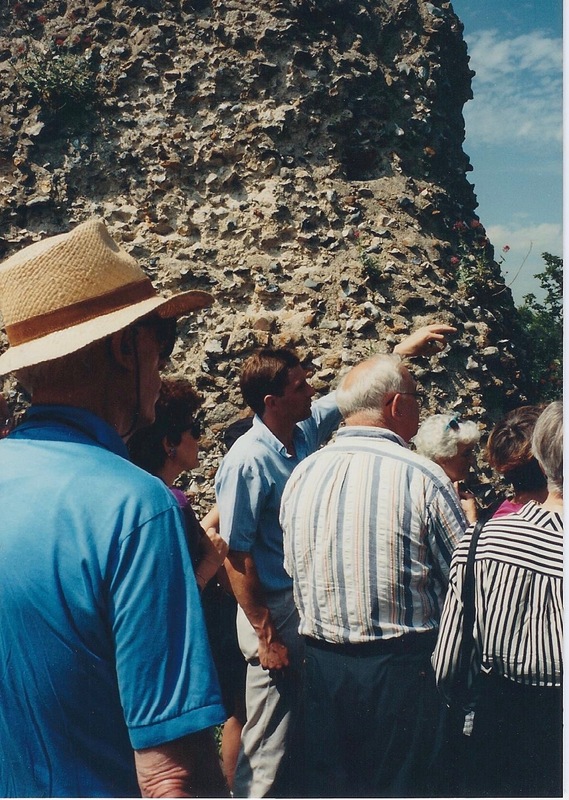 Local residents pulled stones from the monastery ruins. To build new dwellings. 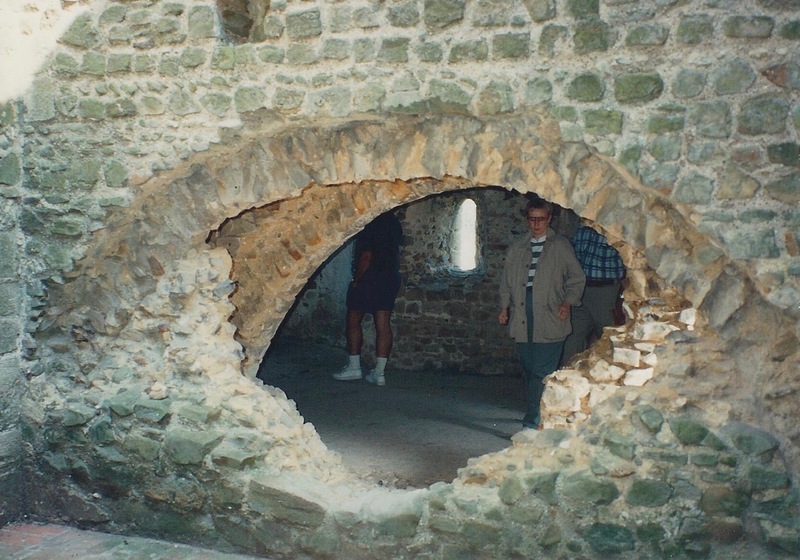 Modern residence, built right into the ruins of the 11th Century Abbey. 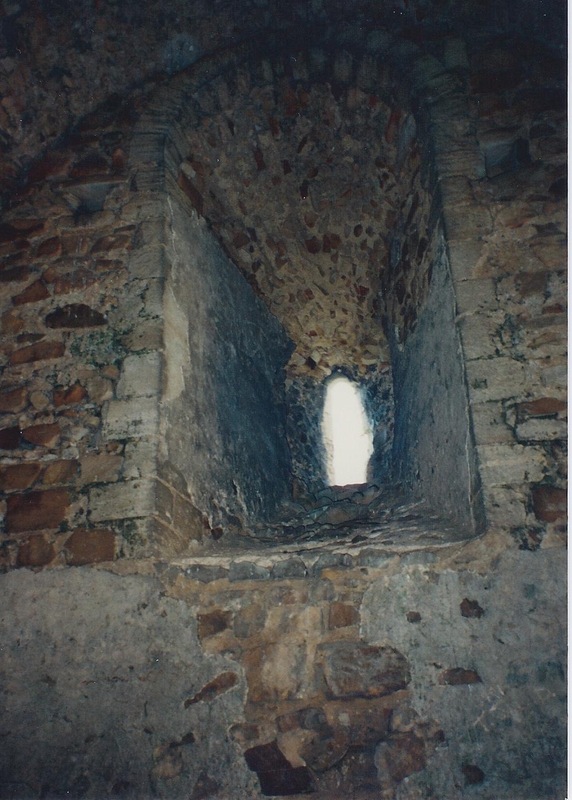 How did the monastery become a ruin? From 1536 to 1541, King Henry VIII dissolved all the monasteries and religious houses in Britain (remember the story of all his wives? ), and confiscated all their wealth, which was prodigious, approaching that of the English Crown itself. 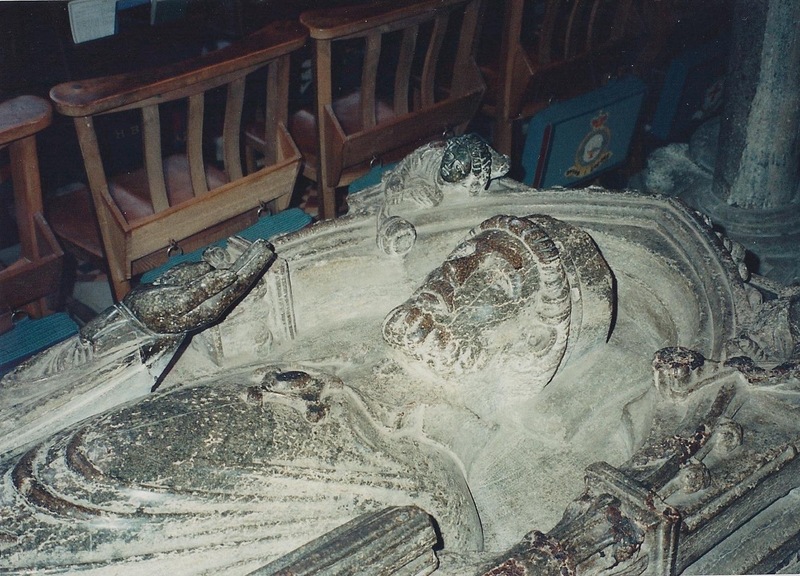 Henry’s minions traveled all over Britain, literally destroying the monasteries, and seizing anything they could carry, defacing what they couldn’t. 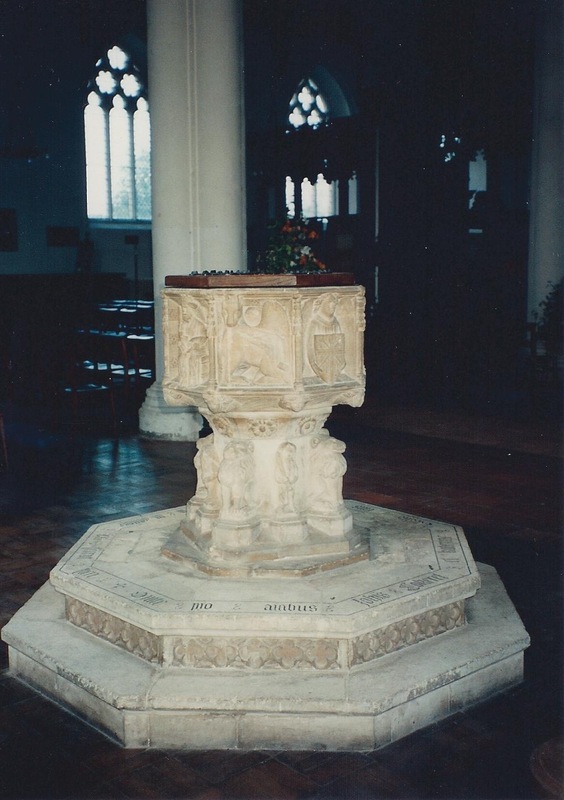 This was the beginning of the Church of England (Anglican). I like to think that I count my blessings every day, not just on Thanksgiving Day. This year, I’ve had numerous occasions to reflect on the manifest blessings in my life, and my country. I was fortunate to be born in the United States of America, which has, since its founding in the 18th Century, been a beacon of light, hope, and goodness in the world. Up until the founding of this great country, the lot of the vast majority of human beings on Planet Earth has been squalor, poverty, disease, backbreaking work, and often early death. Families had to produce many children in order for a few to survive birth and childhood. Few were educated at all, and even fewer attained a high level of education. 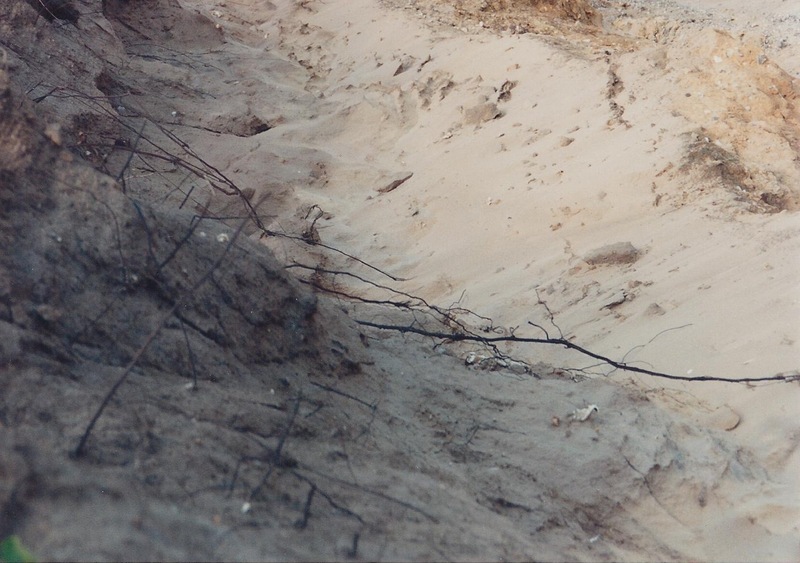 Farmers destroyed huge forests to clear fields for planting, and those fields sometimes lost their fertility quickly, necessitating more forest destruction. Plagues regularly decimated entire populations, and no one knew why or how to stop them. How different is our world today! How many people now consider it a right, to grow up healthy and happy, graduate from college, and pursue a lucrative career doing whatever makes them happy. Our Founders bequeathed to us a Nation, conceived in Liberty, and dedicated to the proposition that All Men are Created Equal (hat tip, Abraham Lincoln). Contrary to sometimes popular belief, Americans are the most generous, most virtuous, and happiest people on Earth. The USA has been the greatest force for Good ever imagined, and millions of people in many countries have US generosity and help to thank for their position today (we virtually rebuilt Germany and Japan after World War II, and they are some of our greatest allies today). When a natural disaster occurs anywhere on Earth, everyone looks to the United States first to jump in and make things right. Minority groups such as my people the Jews, and black people, have found their lives immeasurably improved here in the United States, where we can go to school, live well, and earn a very good living just about anywhere. Did you ever stop to think about why so many people from all over the world are clamoring to get into the United States? As much as others may denigrate the USA, they still view living here as the best place to live! I am properly grateful to God for allowing me to have been born in the USA, lived in a beautiful area for most of my life (the Pacific Northwest), and having health, earned wealth, and a family (though no children). I am married to a wonderful man who has a great job, and is an excellent provider. I myself have a pretty good job, at a company that makes products that improve peoples’ lives every day. We both derive great joy from being able to play music, which enriches our lives and others’. I own my house free and clear, both of our cars are paid off, and we are able to put away money for the future, while being able to buy just about anything we need today. We have many friends, especially our musician friends, and our Ricochet online (and offline) family. One of the benefits of being fairly well-off is the ability to give some money away. I find that it is delightful to be able to donate to causes that we believe in. Just last week, I was thinking of how much I am going to enjoy writing a “Christmas present” check at the end of the year to Hillsdale College. It’s actually fun, deciding whether to donate to the Music department, the College Library, or the History department. This year, I gave donations to the Cystic Fibrosis Foundation, the Leukemia and Lymphoma Society, and the American Friends of Yad Vashem (the Holocaust memorial museum in Israel). Yes, the Joy of Giving is real. And I find that the more I give, the happier it makes me. So this Thanksgiving, I am thankful for everything I have, and the people I love, and our great country, which is the Greatest Country on God’s Green Earth. And for everything my fellow humans have done to make this world a better place to live for everyone. This past week, Hubby and I were fortunate enough to attend the World Men’s Squash Championships in Bellevue, Washington. He went all week, and I attended the quarter-finals Friday, semi-finals Saturday, and exciting Final match on Sunday. There were players from all over the world. South Africa, Egypt, USA, Canada, Finland, Pakistan, England, France, and Australia were some of the nations represented. All the matches were demonstrations of awesome talent, in a sport that is not very well-known. France beat Omar Mosaad of Egypt in straight sets. Normally, squash spectators are pretty quiet, riveted by the demonstrations of strength, stamina, and skill of two players smacking the small white ball around the glass court. But individuals would call out their favorite player’s name, urging them on. The audience erupted in loud shouts when Gaultier put away the last shot giving him the World Championship. Vive la France!! I admit it. I am a total Anglophile. 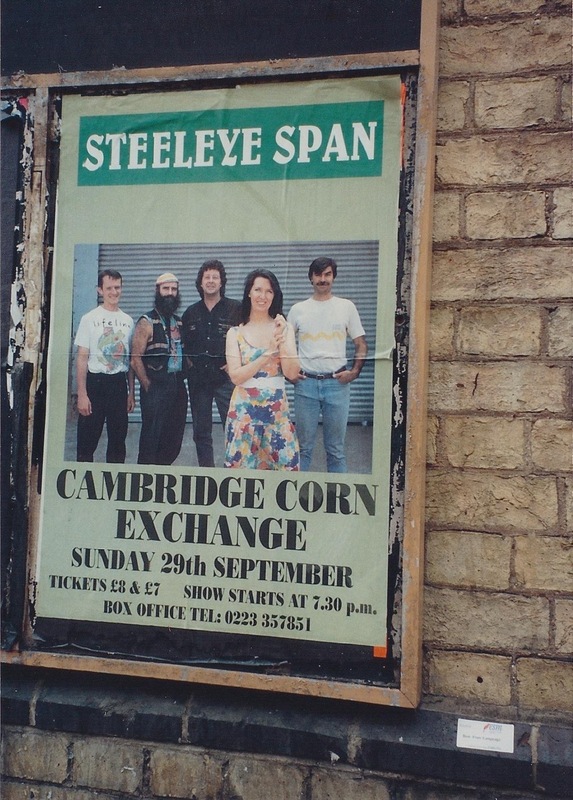 I’m a sucker for a British accent, and since a trip around Britain in 1984, I fell in love with the city of Cambridge. 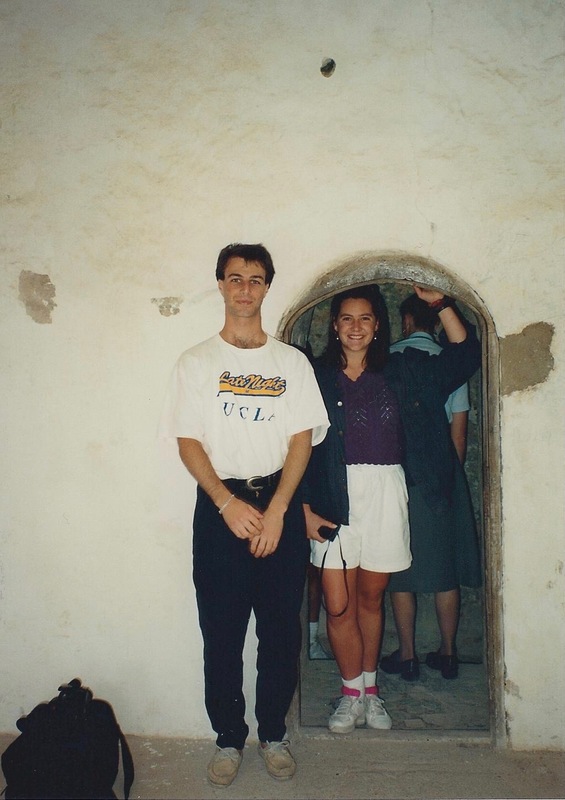 In the summer of 1991, I was fortunate enough to attend a three-week program put on by UCLA in Cambridge. Attendees could take any of 8 different courses, from Country Houses, to Literature, to Medieval English Society, for UCLA credit or not. So in January, I signed up to take Medieval English Society, not for credit since I already had a Master’s degree and just wanted to learn. A few weeks in advance, I received a big packet of information about the course, the college, and a big reading list for my class. The information said that you could write a paper if you wanted, and the professor sent a list of possible paper topics. 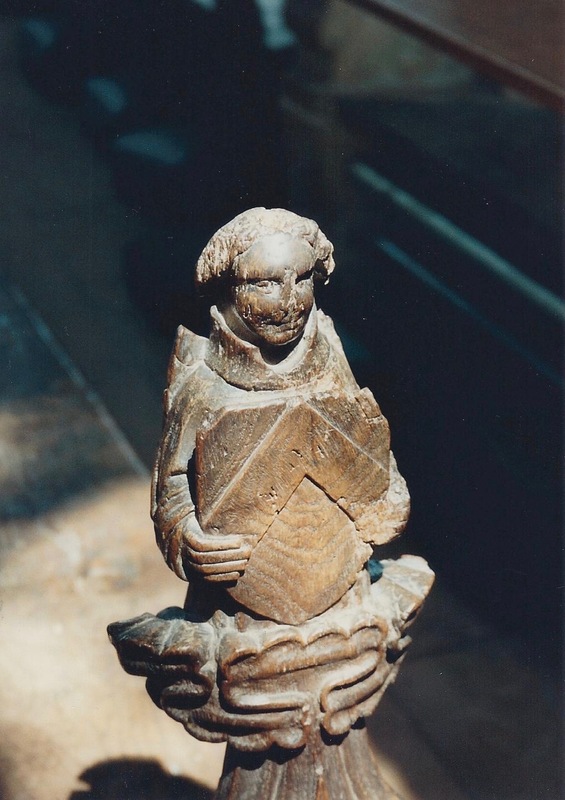 If you have been reading my blog at all, you are aware that I wrote a paper on medieval music, and it is posted below. I went out and bought the recommended books for my class, which included a book on peasant life, and the memoirs of a monk named Jocelyn de Brakelond (which was fascinating, and proof that human nature never changes). Needless to say, I had sufficient reading material for the eight-hour flight! I got off the plane at Heathrow Airport, and caught a bus to Cambridge. 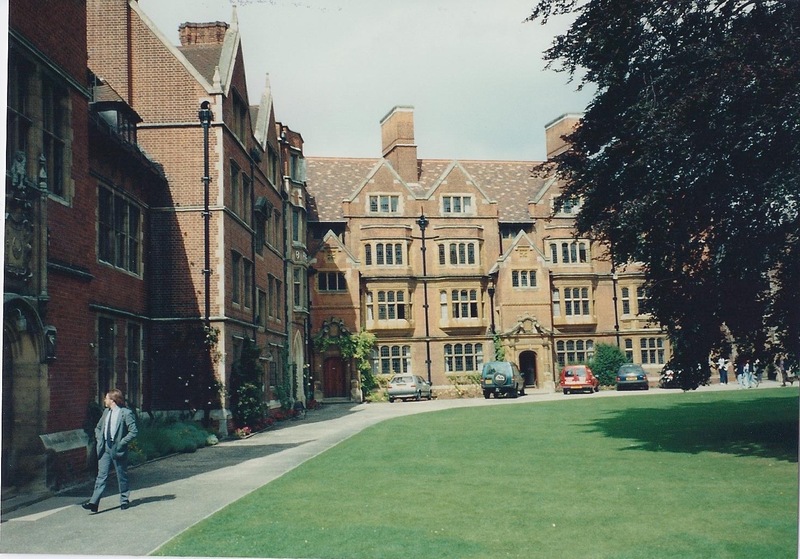 I arrived in the afternoon, and hauled my luggage up to the gate of Trinity Hall College (not the same as Trinity College, next door). The nice man at the entrance gate gave me my welcome packet, a map, and directions to my room. I had, all to myself, a beautiful room in a building that had been around since the 16th Century. 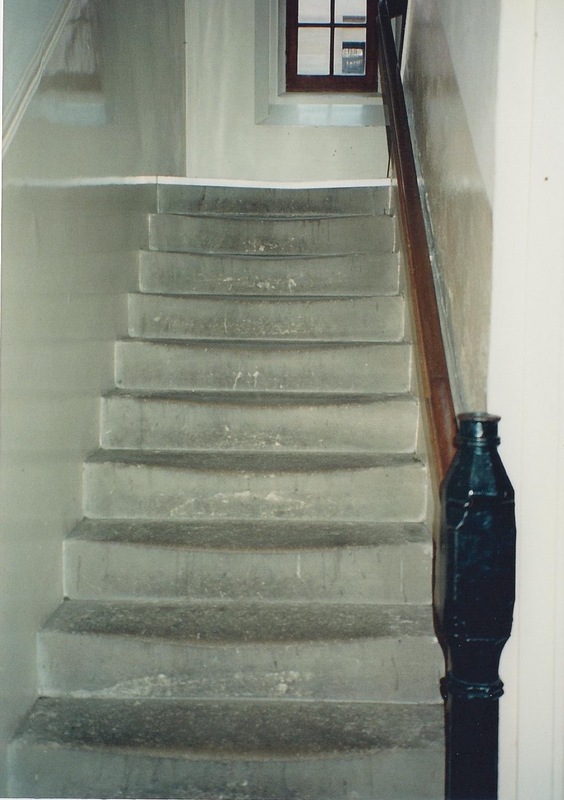 I wondered how many students had trodden these well-worn stairs. Since I had some time before the first formal function, I got out my camera and took a walk around the grounds of Trinity Hall. 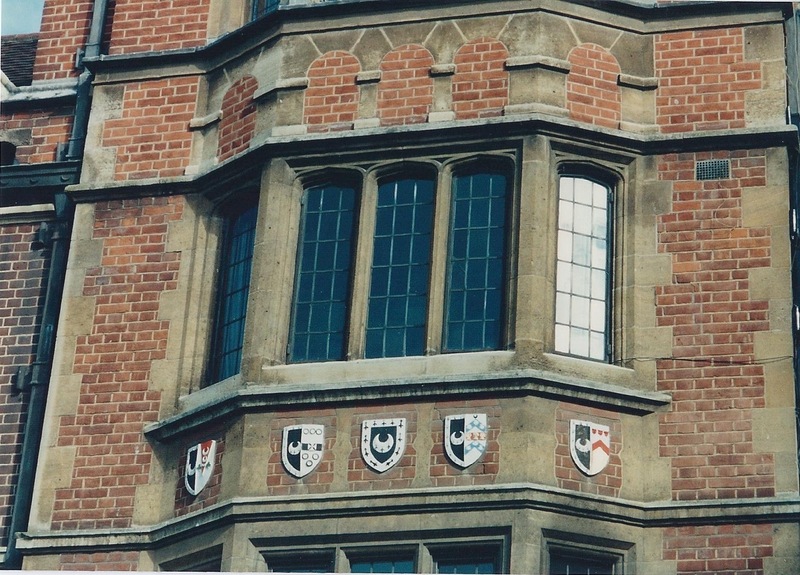 The college was started in the 1500’s to train Canon Lawyers, and traces are all over the college. 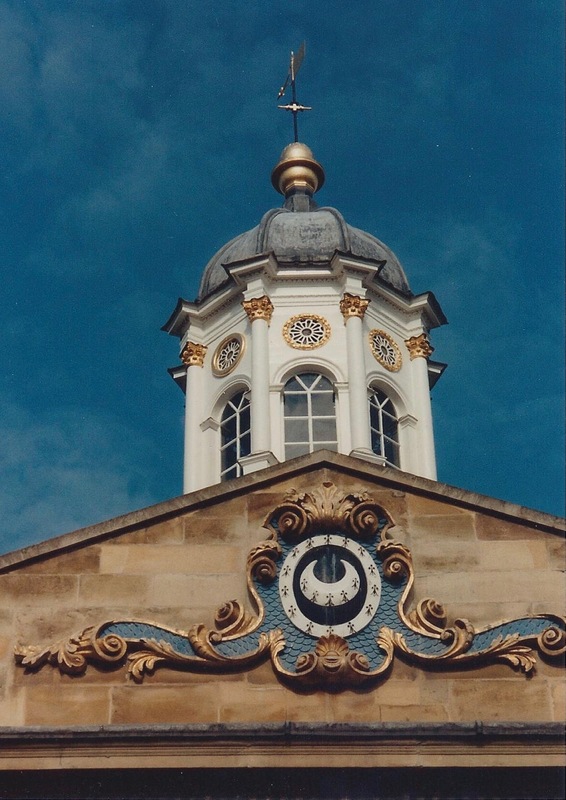 The Tower, pictured here, has the white crescent coat of arms of the College. The evening brought introductions, and a tour of the College. This is one of my most favorite places, the Dining Hall. Dining Room at Trinity Hall College, where we stayed. Meals there were fun. The room was so beautiful, and the food wasn’t bad either, though they did find dozens of ways to describe various shapes of roasted potatoes! We almost felt like royalty at meals, since there was waitstaff at every meal, made up of students earning tuition money. They were delightful. Oh yeah, and the College has its own bar! A bunch of us would meet there each evening before dinner, and we were able to carry our drinks with us to finish with our meal (this was when I discovered Guinness Stout, and I had my half-pint daily. At least once during the three weeks, each attendee got to sit at the High Table for dinner, and speak to the after-dinner speakers we had three times a week. I was seated next to the gentleman who was the Cambridge City Librarian, who told me that he had never traveled anywhere outside Cambridge. 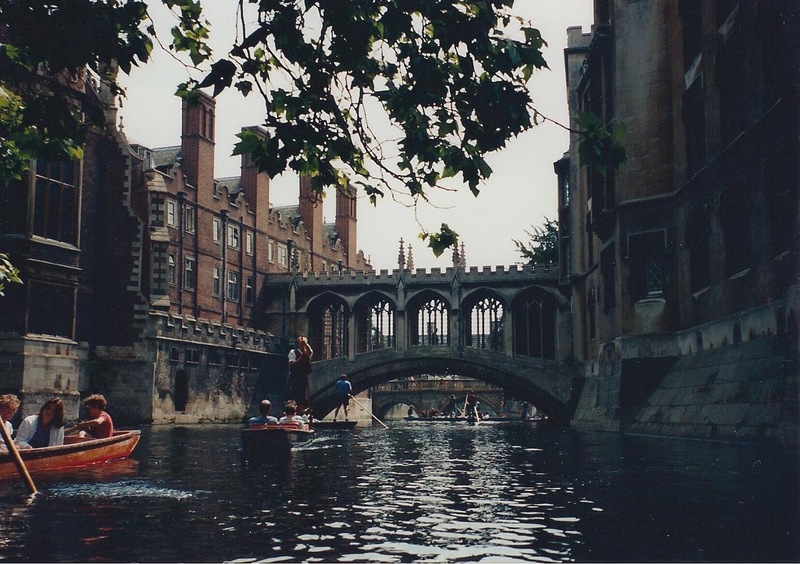 He said, “Why should I travel, when Cambridge itself has so much?” Indeed! 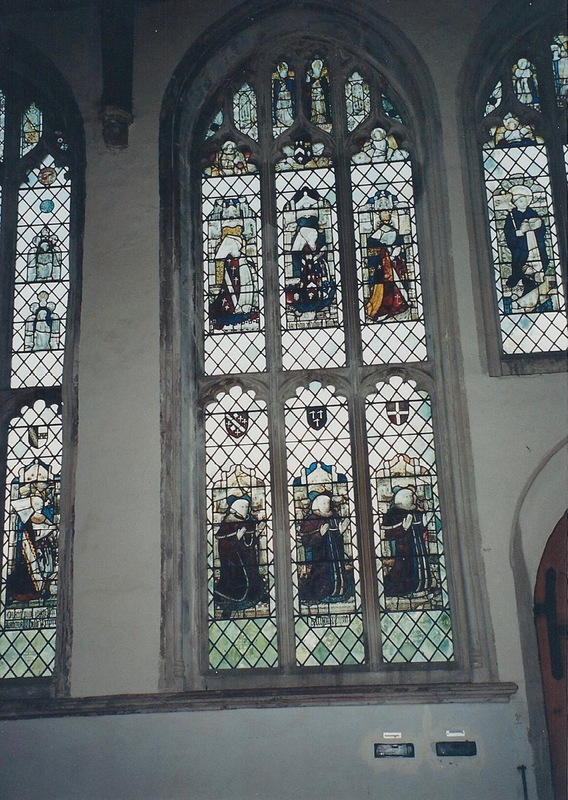 Window at Trinity Hall. Emblems are various groups of Canon Law students through the years. The window above was directly across the central courtyard from my dorm room, always a beautiful sight. 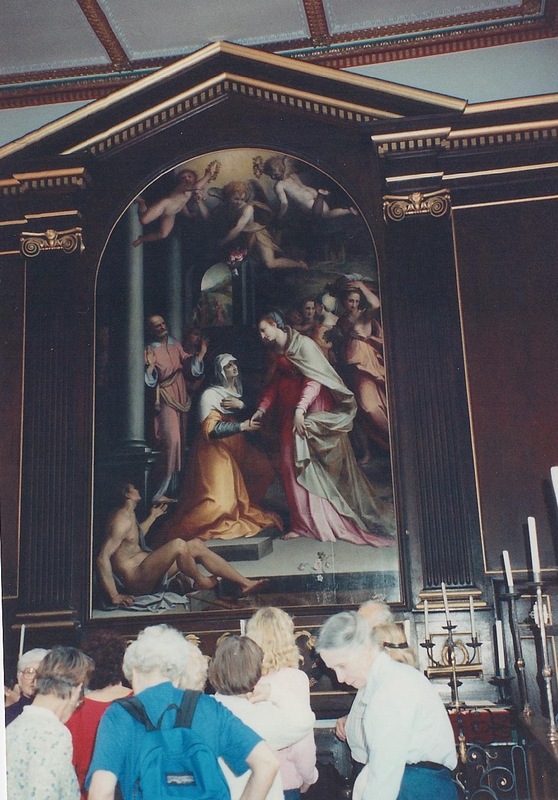 Here are my classmates, admiring a beautiful painting in the Trinity Hall Chapel. 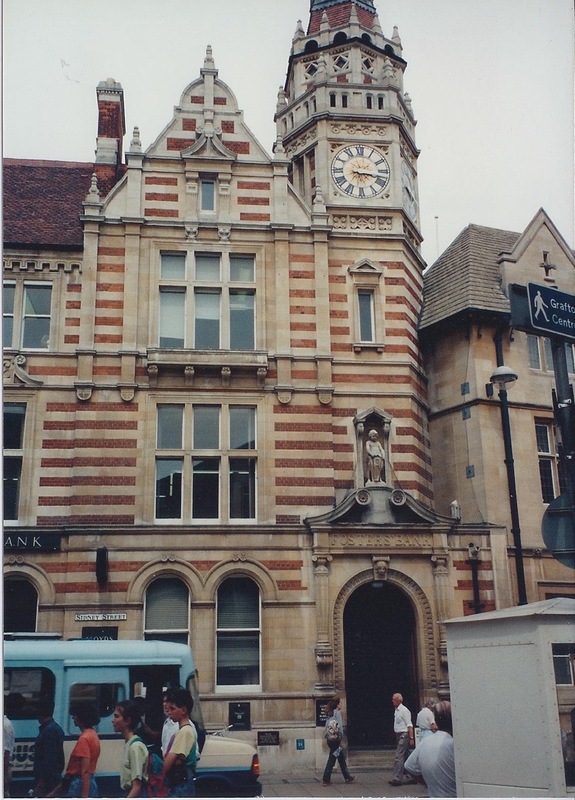 The first class day was taken up with a walking tour of the town. 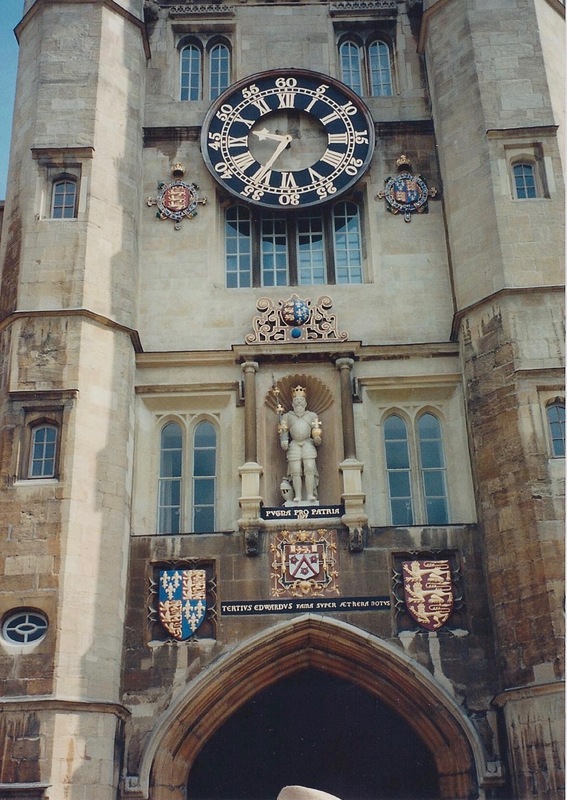 The City of Cambridge, where the Colleges are, is basically owned by the University, so its buildings may not be changed without College permissions. 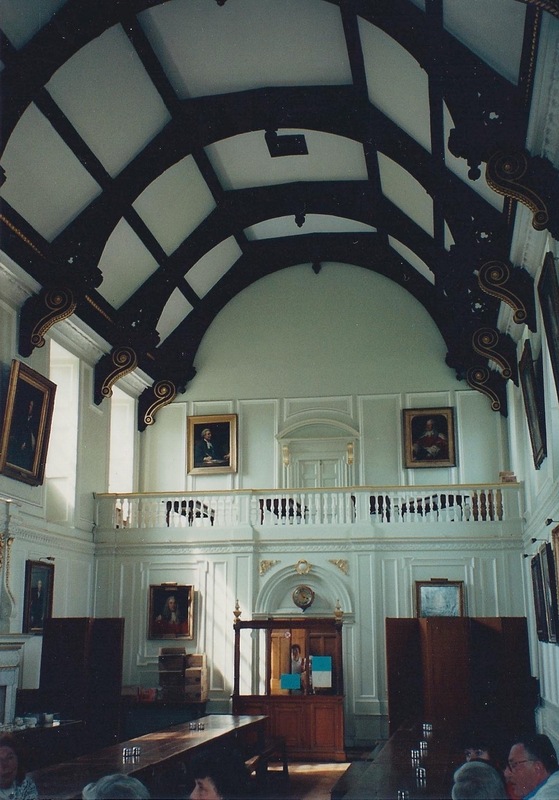 Many of the old college buildings have been lovingly kept up and restored, and I have to say they are all just gorgeous. 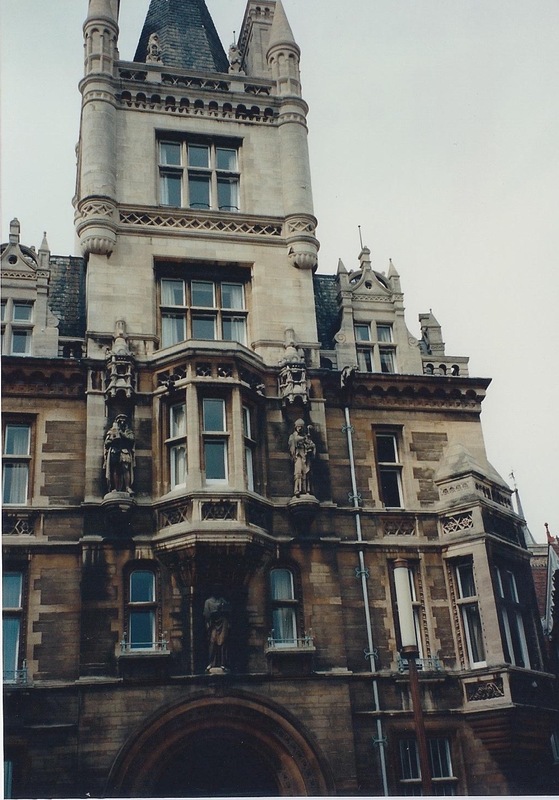 We here in the USA don’t have anything to compare with these Cambridge College buildings. Trinity College is right next door to Trinity Hall. 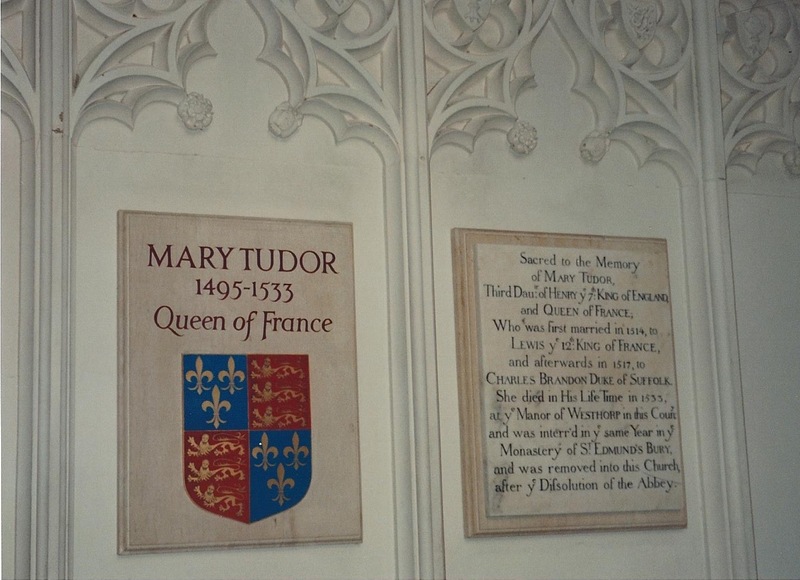 If you look carefully, you can see the mention of Edward III, who was the patron of Trinity College. St. John’s College is right down the street. I just love the ornate stonework over the gate. 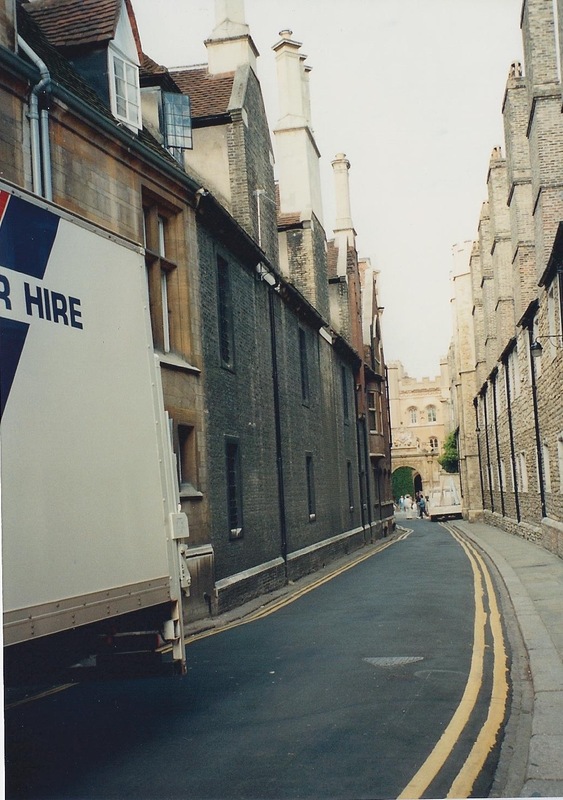 Now, at the back of St. John’s College, you see this. 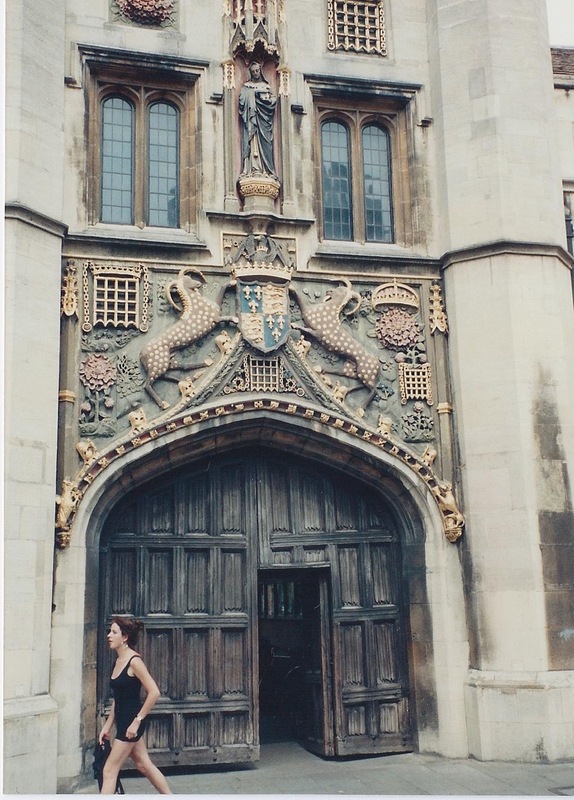 This is the door to Peterhouse College, Cambridge. 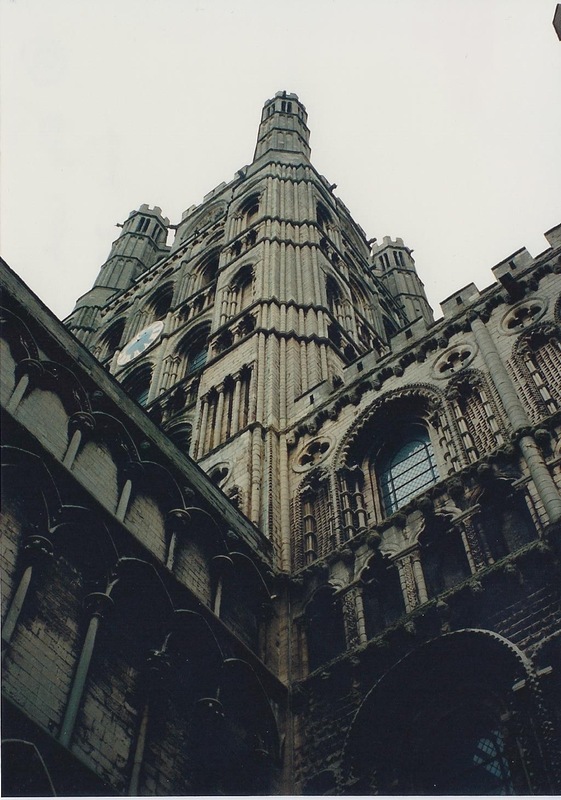 It’s the oldest College, started by the Bishop of Ely in 1284. 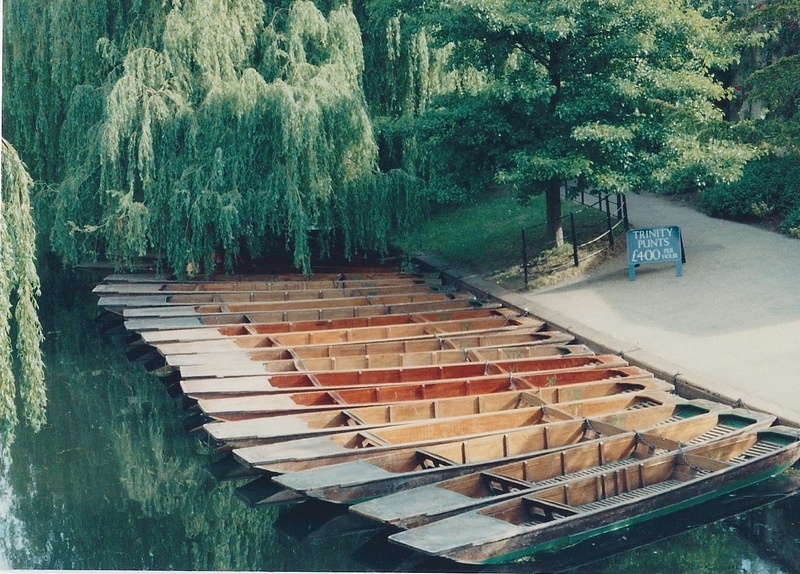 Many of the Colleges back right up to the River Cam. I found the river as it meandered through the city very peaceful and relaxing to watch. 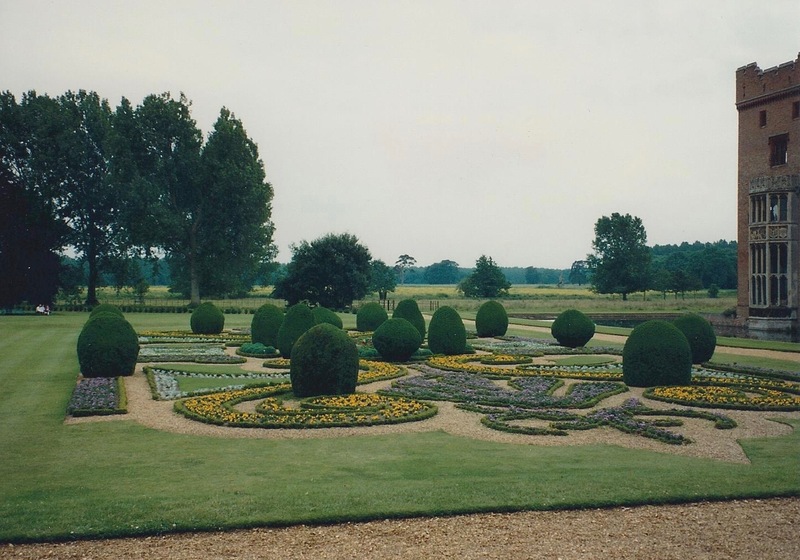 This is the view of the river from the back lawn at Trinity Hall. 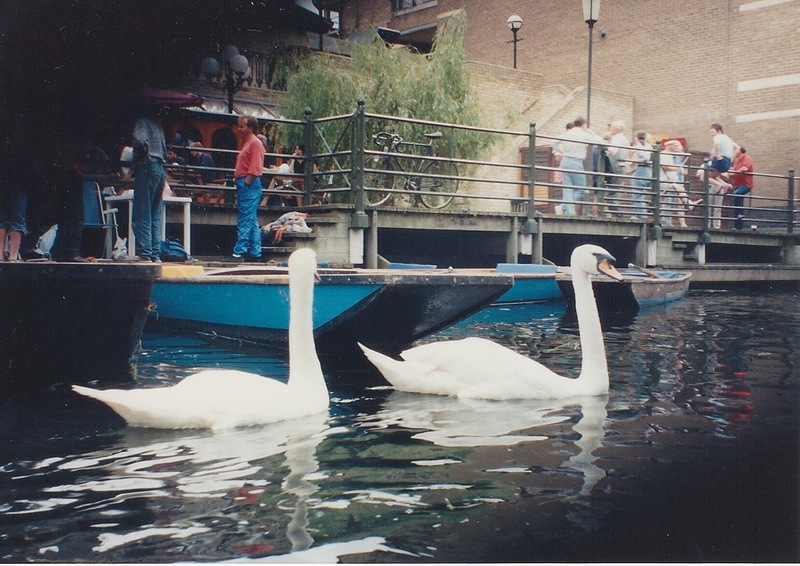 These were on the river, next door at Trinity College. They can be rented. 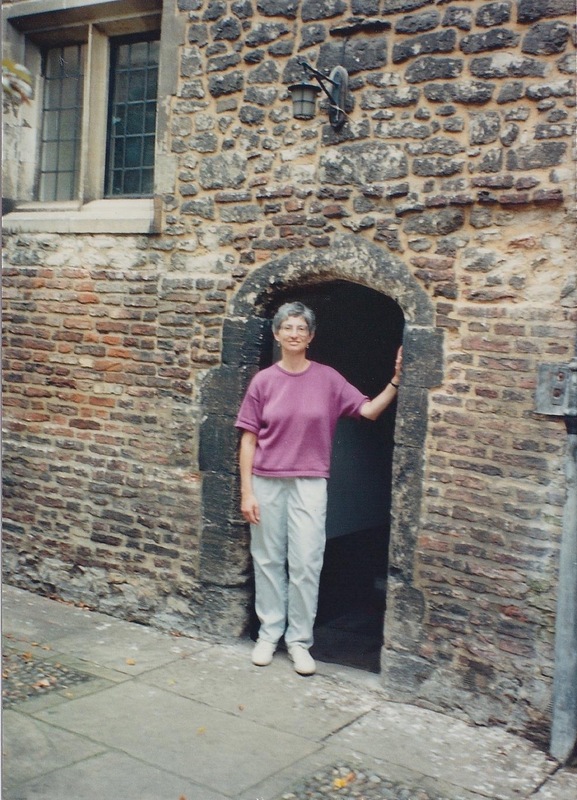 Here’s a picture of me, standing inside a doorway in the College, original to the earliest days of Trinity Hall. 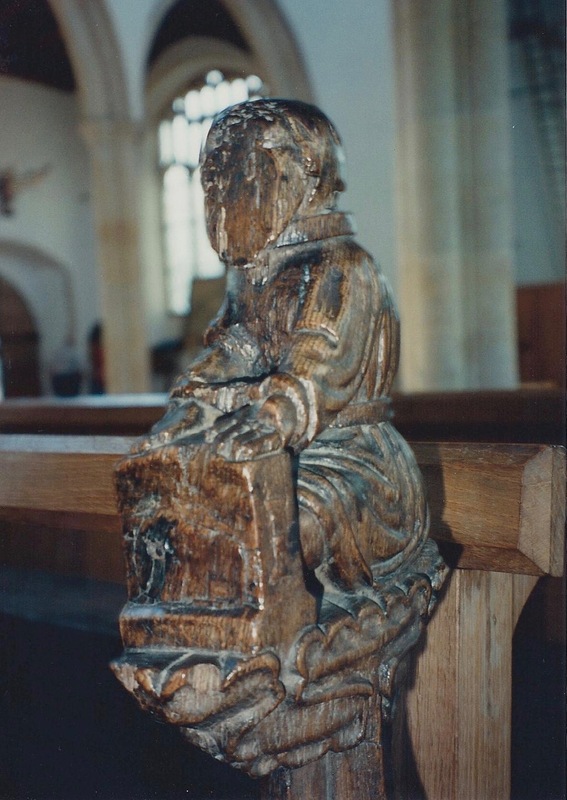 People were much shorter then than they are now! 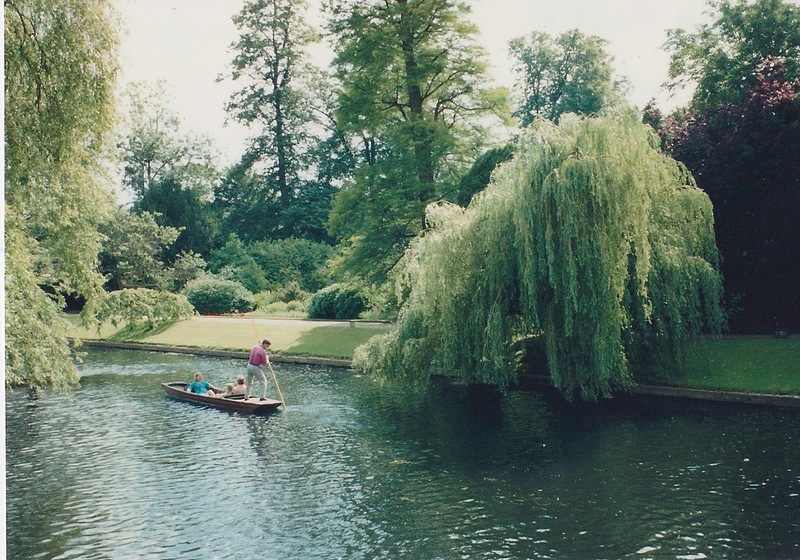 A punter on the River Cam, which forms the back boundary of Trinity Hall. When I had free time, I would go walking through the town. 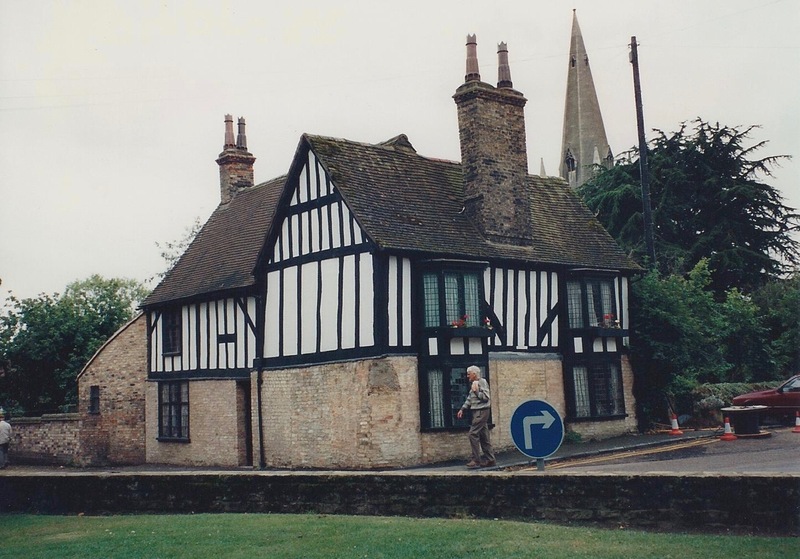 I never tired of the beautiful old buildings, which just seemed to ooze history. On a lighter note, I found this poster just the day before we left for home. They are one of my VERY favorite bands, and I was sad not to be able to attend their concert. 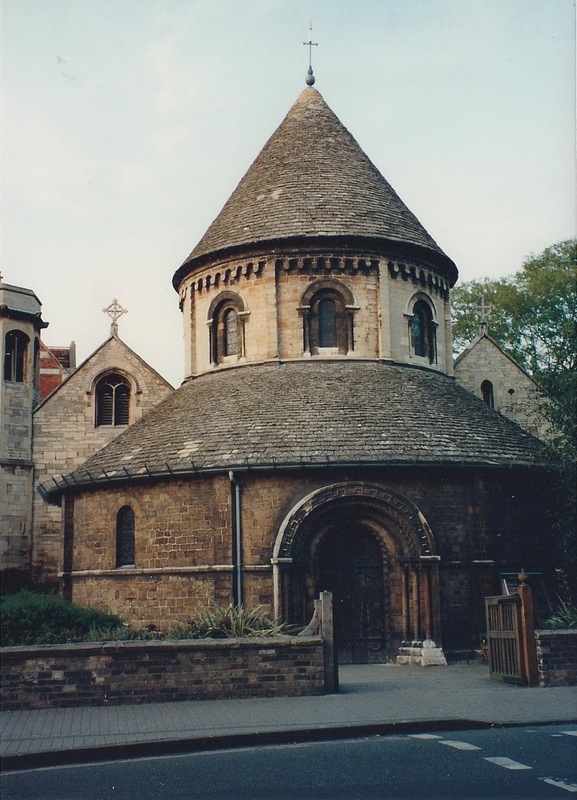 Our Professor for the Medieval English Society class was a teacher at Gonville & Caius College, whose specialty was the agricultural economy of the medieval period. One day, he took us to see his College Library. This is the part of the College. The College Library had a number of ancient books, many under glass. I enjoyed seeing real, honest-to-goodness History! I went to the open shelves, and pulled out a book at random. Here’s what I found. 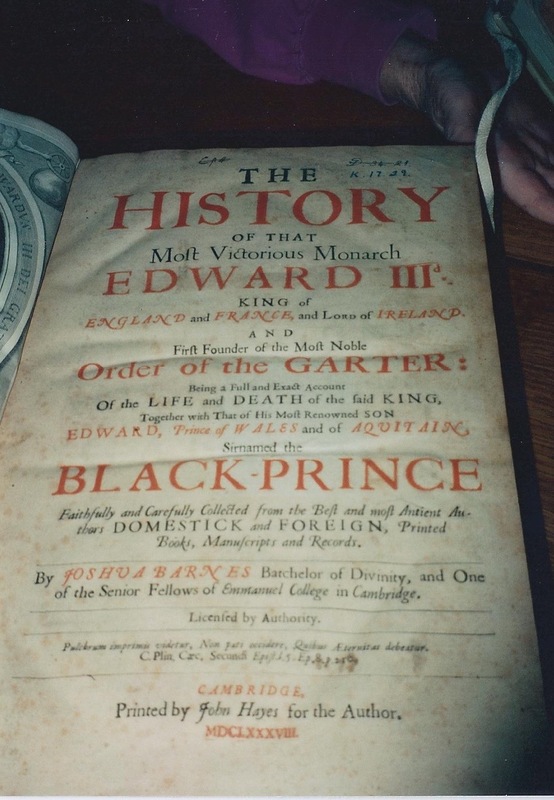 Edward III was the King who founded Trinity College! The book was a bit difficult to read, given the old-style spelling, but I was just bowled over at getting to see the original source material. 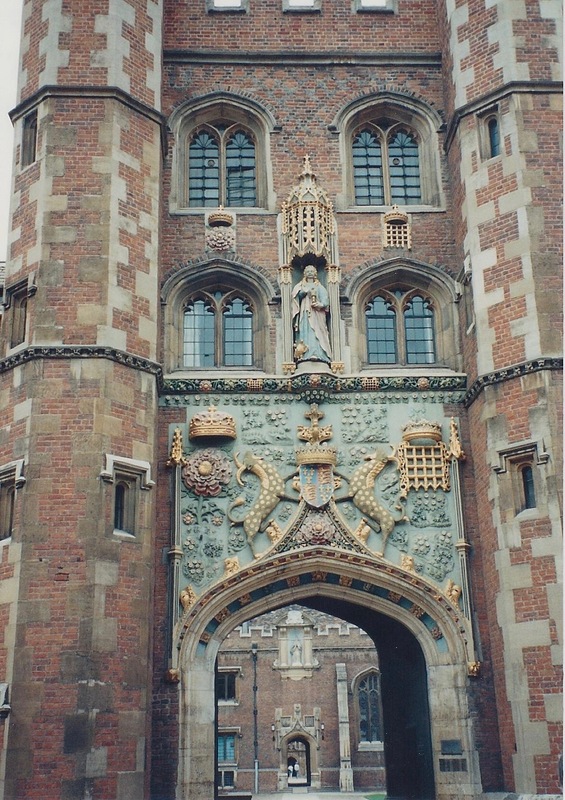 I still retain a dream of actually going to Cambridge and studying history someday. 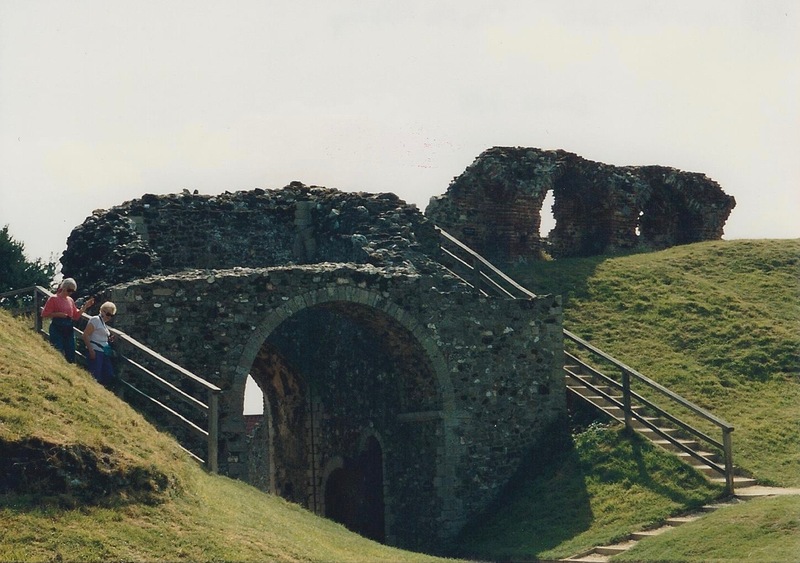 One of our early field trips was to Clare Castle, a ruined castle from the early medieval period. 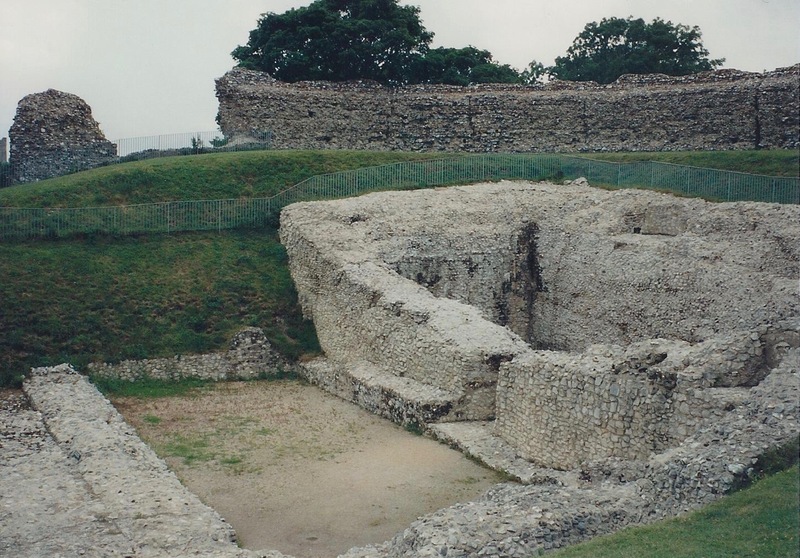 The Professor told us it was an early example of “motte and bailey” architecture. Motte being what we call a moat, and the bailey was a courtyard. 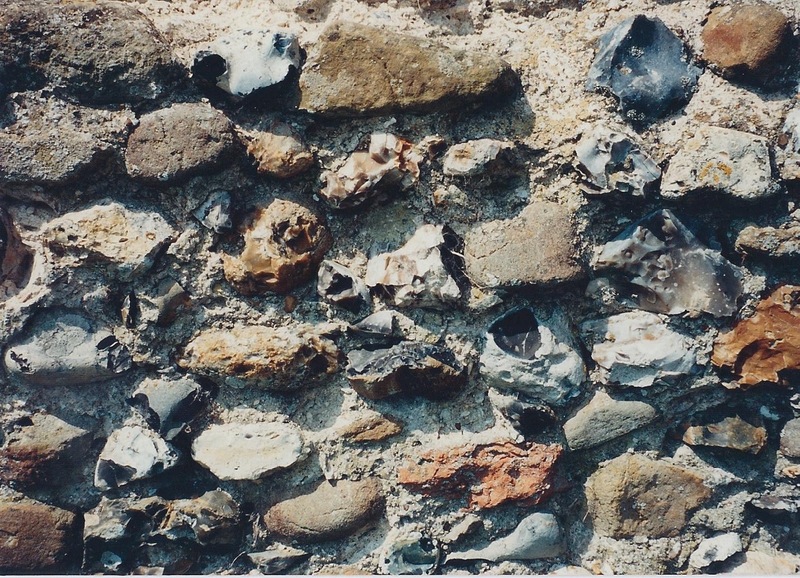 Closeup of a wall at Clare Castle-random stones in cement. 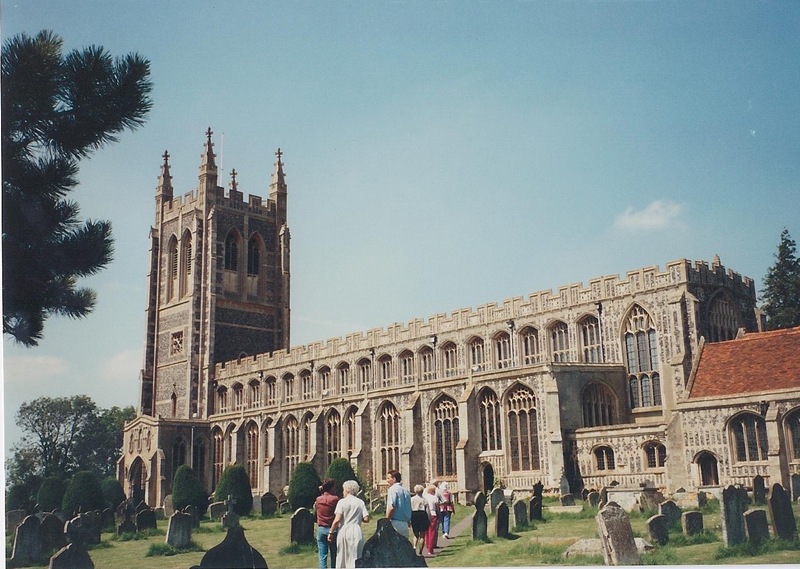 Later that day, we visited the beautiful old town of Blytheborough, which had a nicely-preserved church. 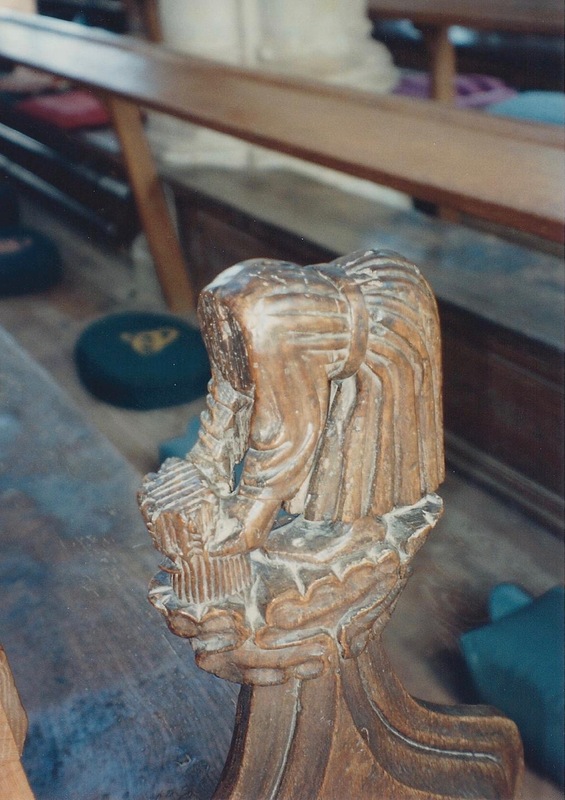 These church pews are 800 years old! 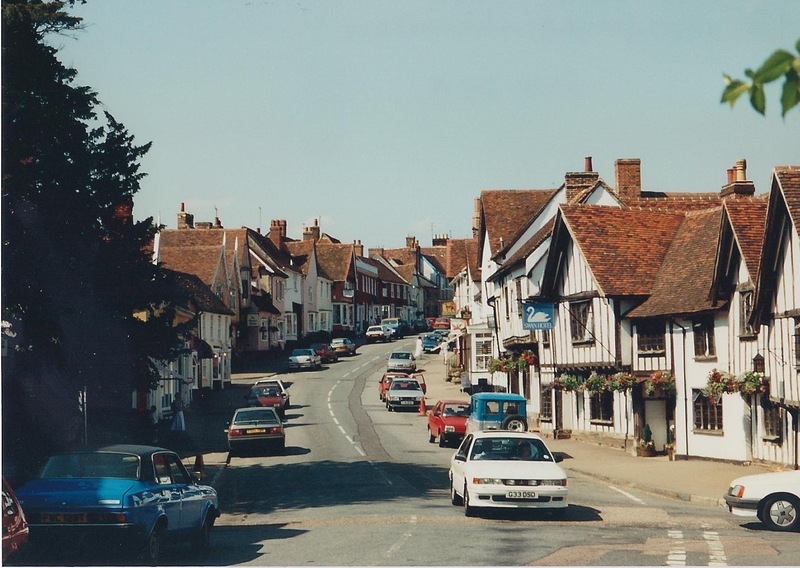 High Street, Lavenham. A wool town. The town has a nice church, too. 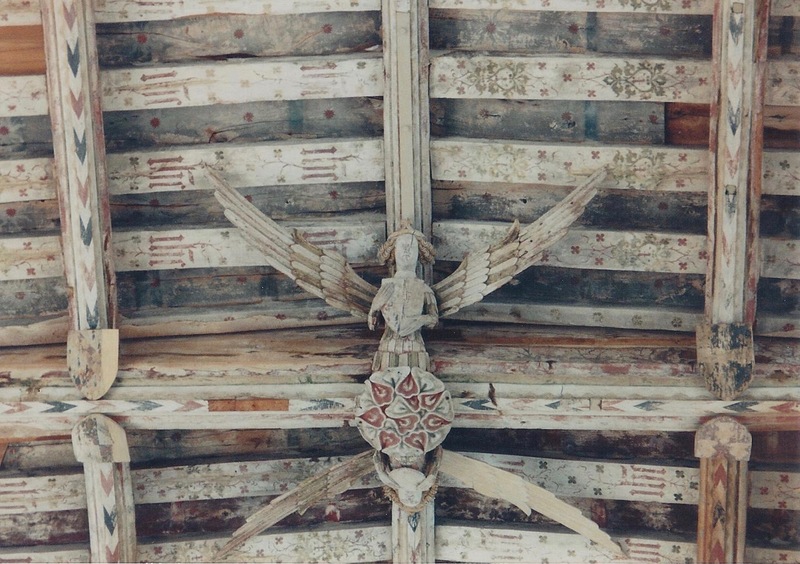 Next, we visited the town of Long Melford, which is known for its medieval church (funny, we did see a lot of churches!). Most of these old churches are still in daily use in their towns. 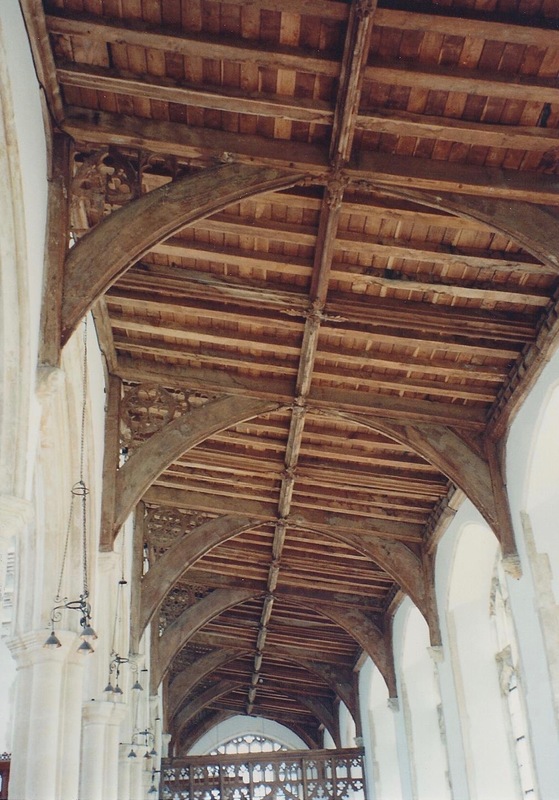 Inside Long Melford Church, beautiful well-preserved wood ceiling. 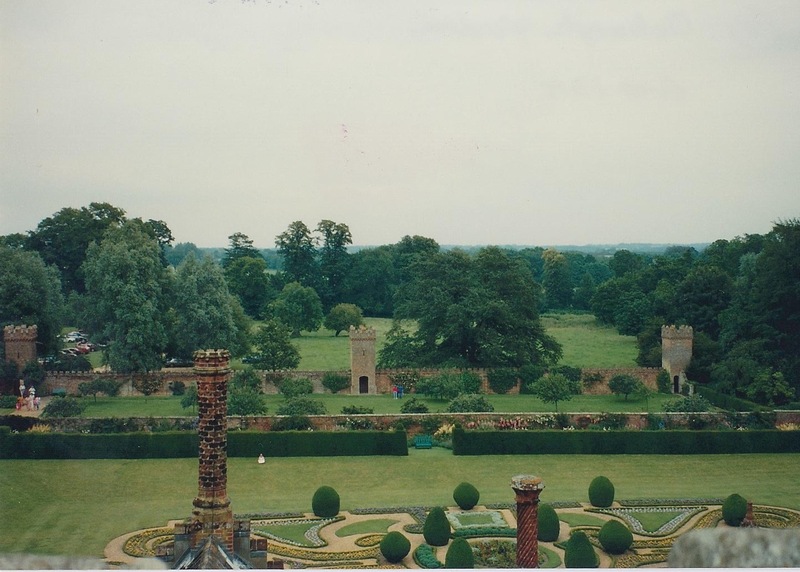 And then there was Castle-Castle-Country house day. Castle Rising first. Castle Rising. First intimation of “pointed arch”. Castle Rising wall. 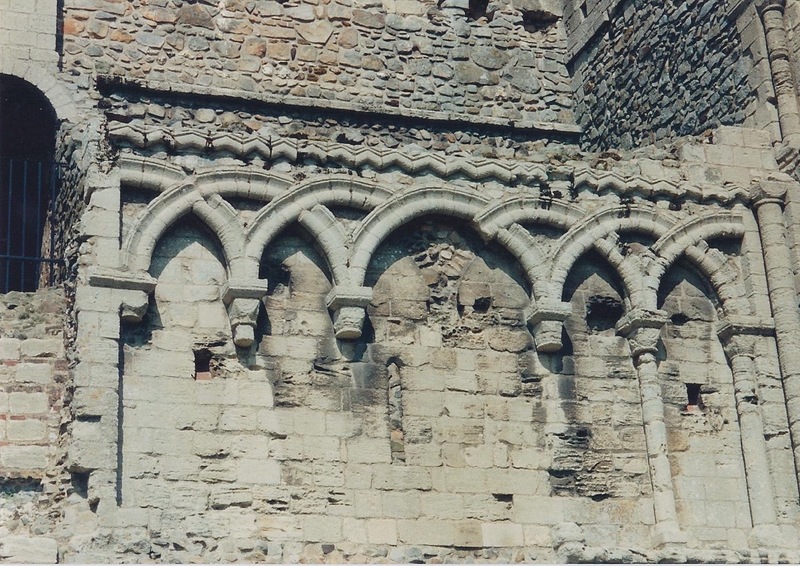 Note the overlapping barrel arches-they make a pointed arch. Overlap two identical things (the barrel vaults), and you get something entirely different. 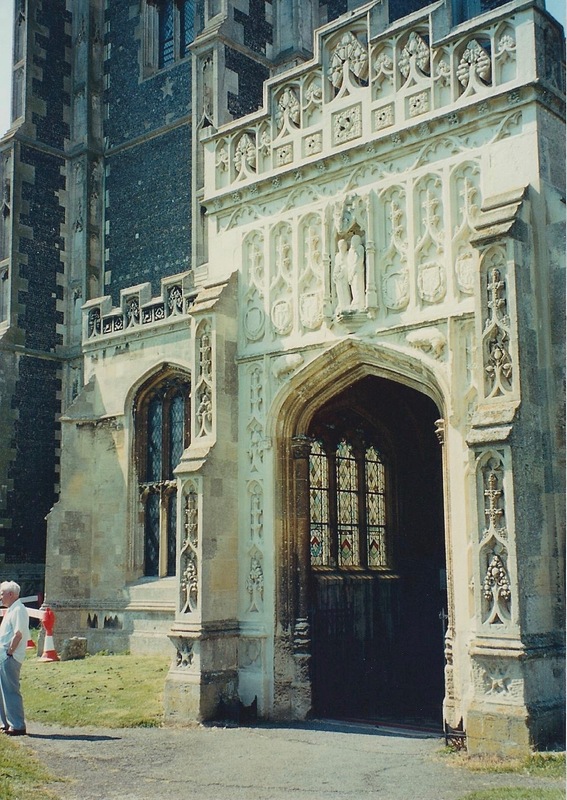 The use later of the pointed arch marked the transition from medieval design to Gothic with its pointed arches. 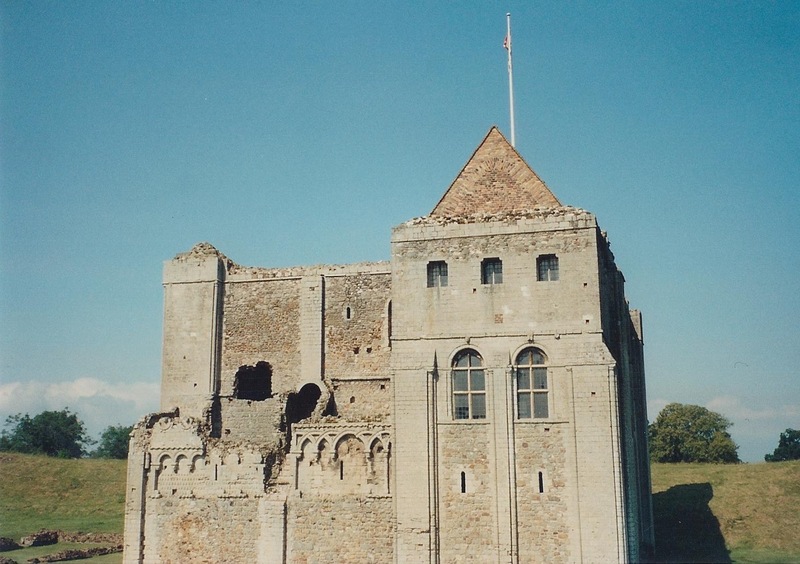 Castle Rising was the place where King Edward III exiled his mother, Queen Isabella, after the execution of her paramour Mortimer. 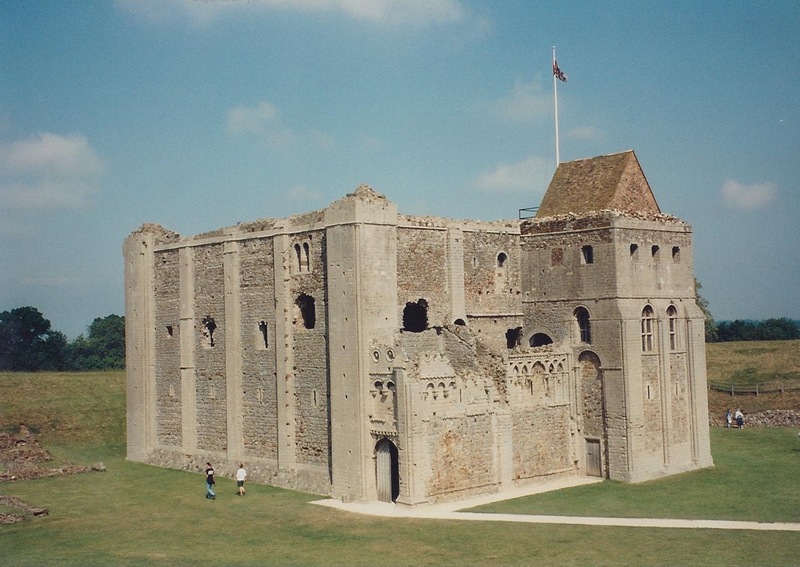 Next stop, Castle Acre Priory. 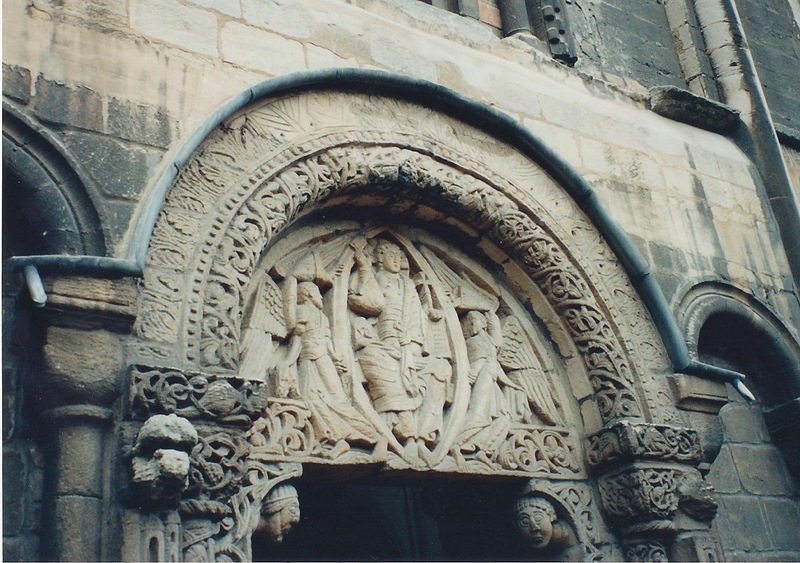 This was a Cluniac monastery, dating from the Norman period, after 1066. 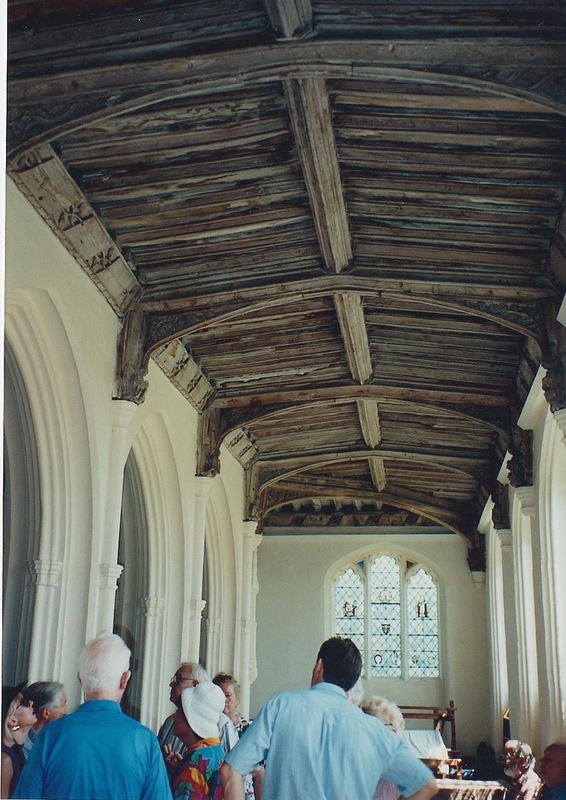 Last stop was Oxburgh Hall, a well-maintained country house, built by Sir Edmund Bedingfield in the 1480s, and added to and changed over the years. 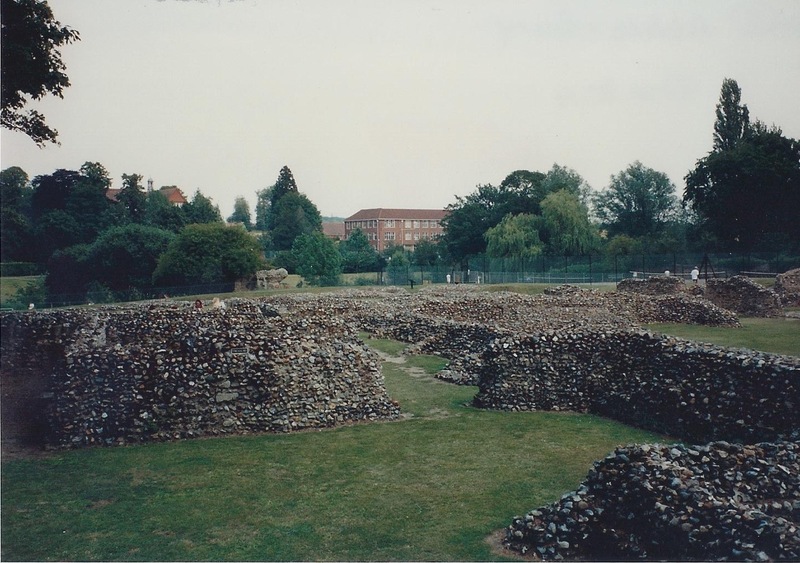 On one interesting day, we went to the Norfolk seashore, to the towns of Orford and Dunwich. 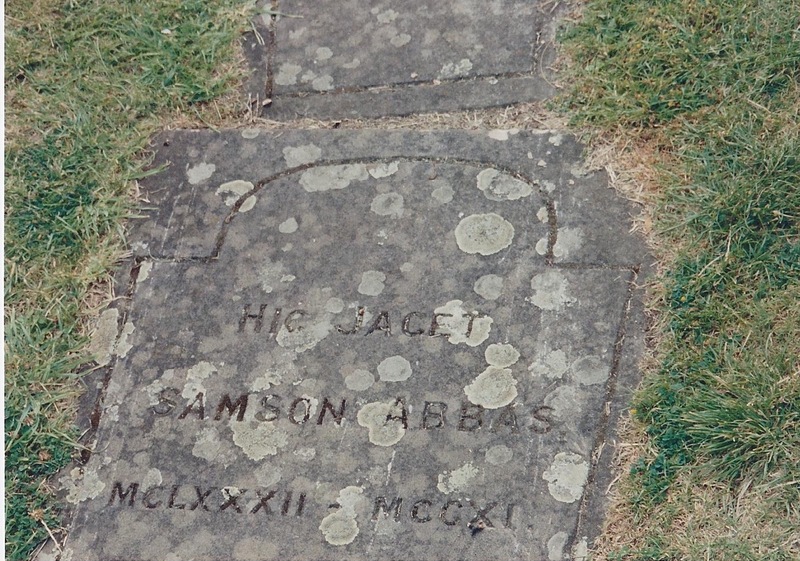 At Dunwich, the North Sea has worn away the coastline considerably, uncovering the medieval church graveyard, and some of the bones of its “residents”. 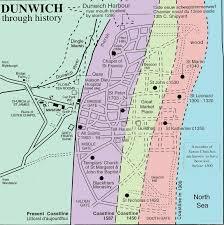 This map shows how the sea is still encroaching on the town. Here is what I saw when I got down on my stomach and took a picture of the embankment. 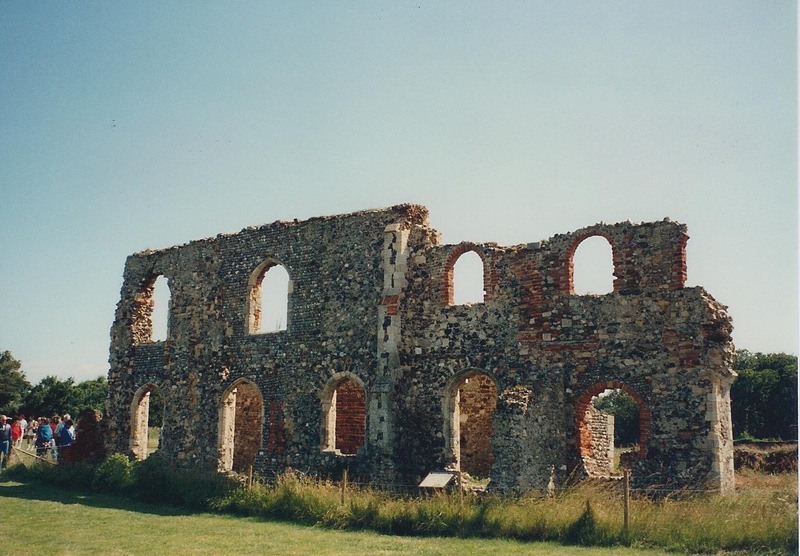 Located near Dunwich are the ruins of the Greyfriars Abbey. 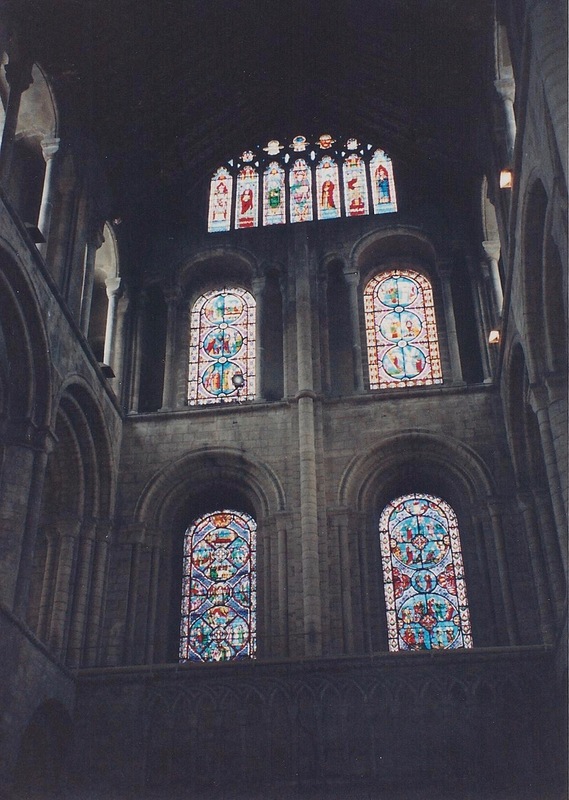 The round (barrel)-arched windows mark it as dating from around the Norman Conquest. 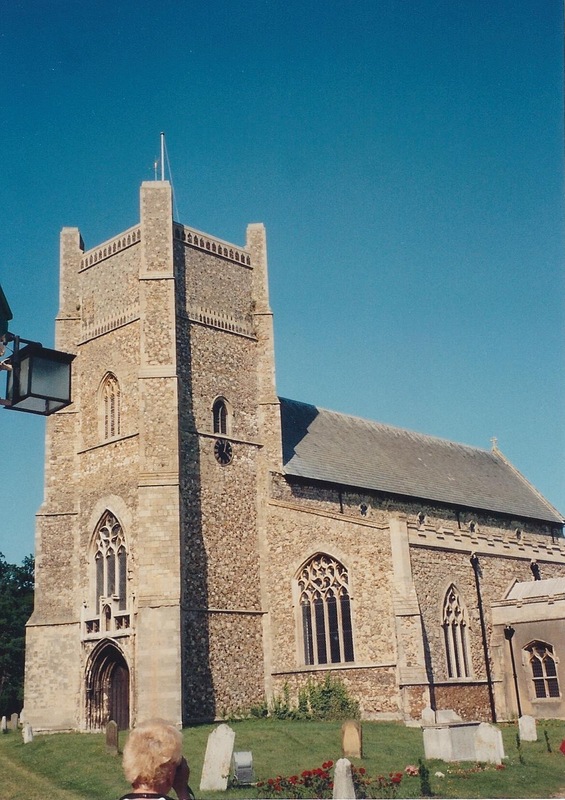 Next, it was on down the road to the town of Orford, also on the coast, and a beautiful…wait for it…Church! The surrounding area was very picturesque. I just love rural Britain, and its green fields, demarcated by stone walls or hedges. It’s not very efficient farming, but it’s simply beautiful and relaxing. 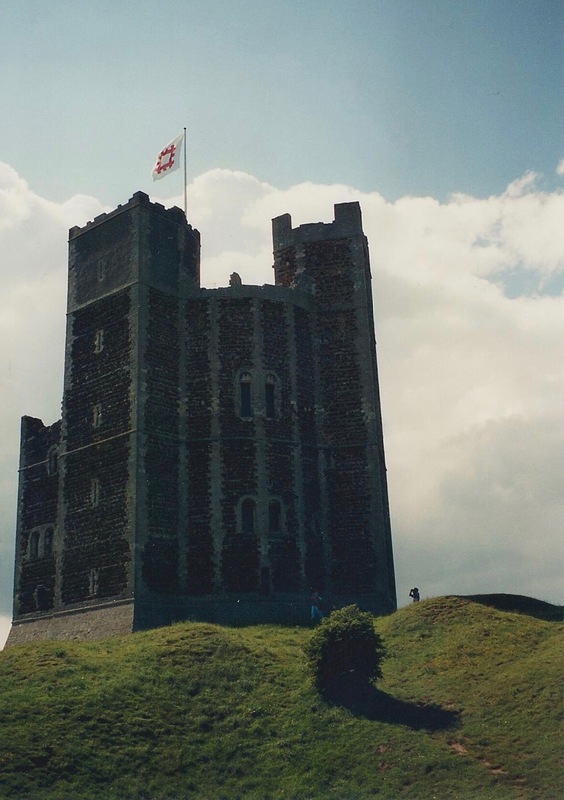 The Castle was built by King Henry II in 1165, and it has 18 sides. 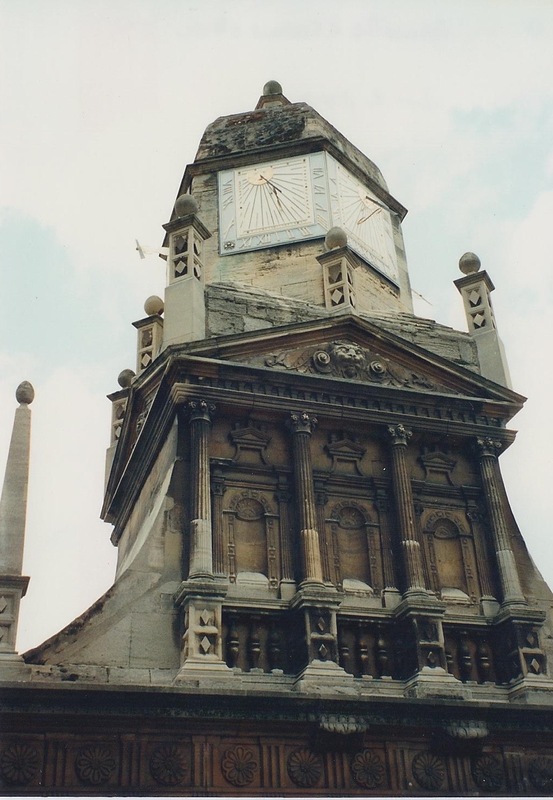 The flag on the top is the British National Trust flag, indicating that it is a significant heritage site. Here are some things we saw inside the church. 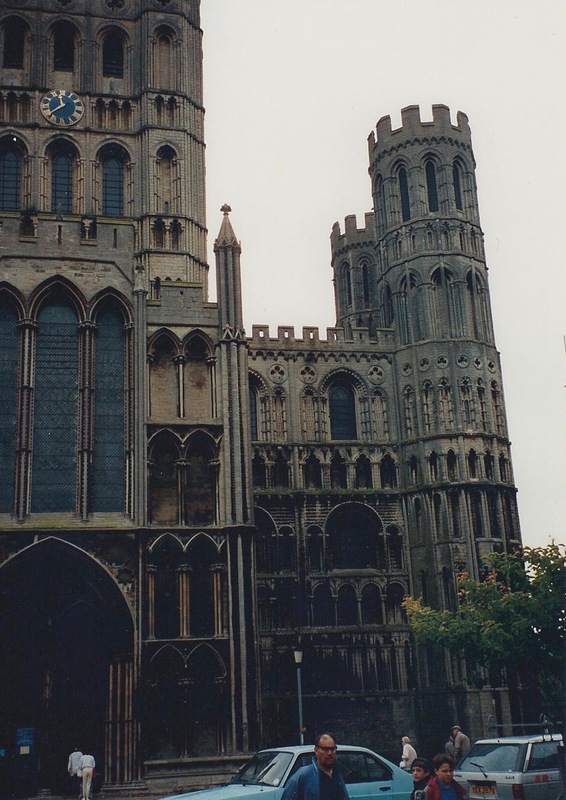 The last out-of-town field trip we took was to the town of Ely, which has a famous Cathedral, and the Abbey (monastery) of Bury St. Edmunds. 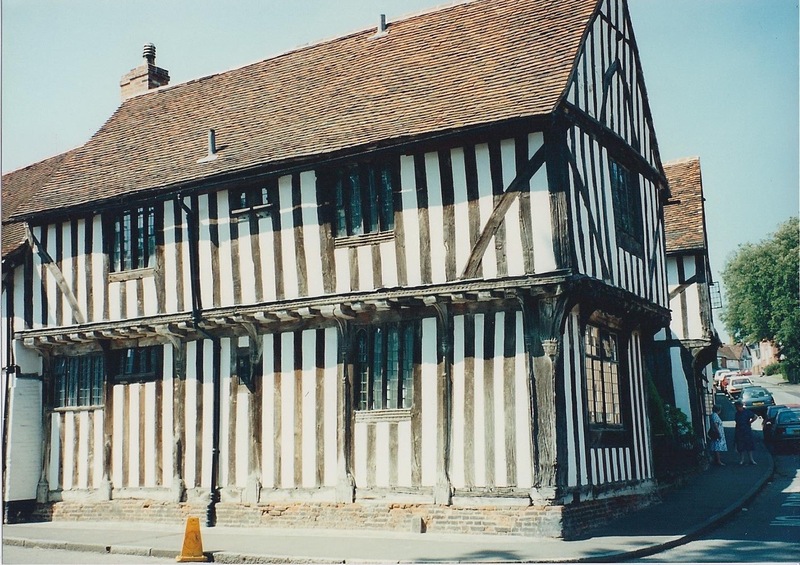 The town is lovely in itself, with homes much like those we saw in Lavenham and Long Melford. 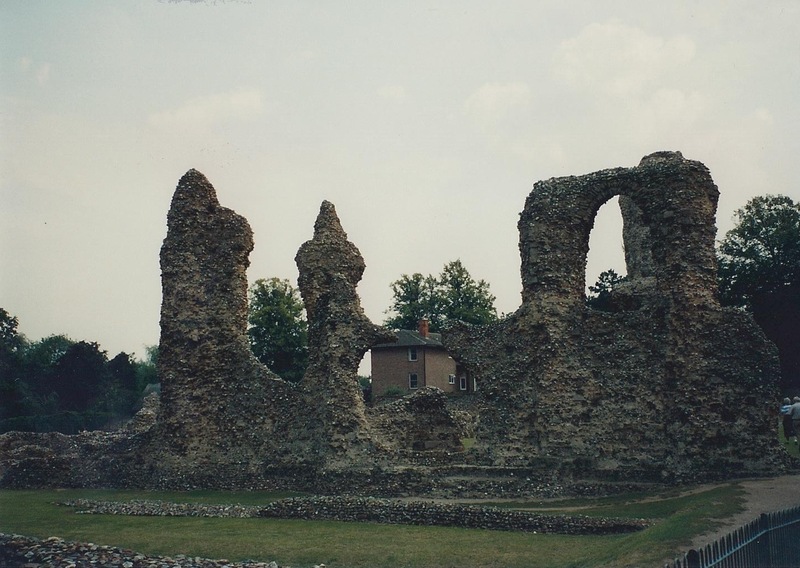 The grounds of the ruined Abbey are very interesting. 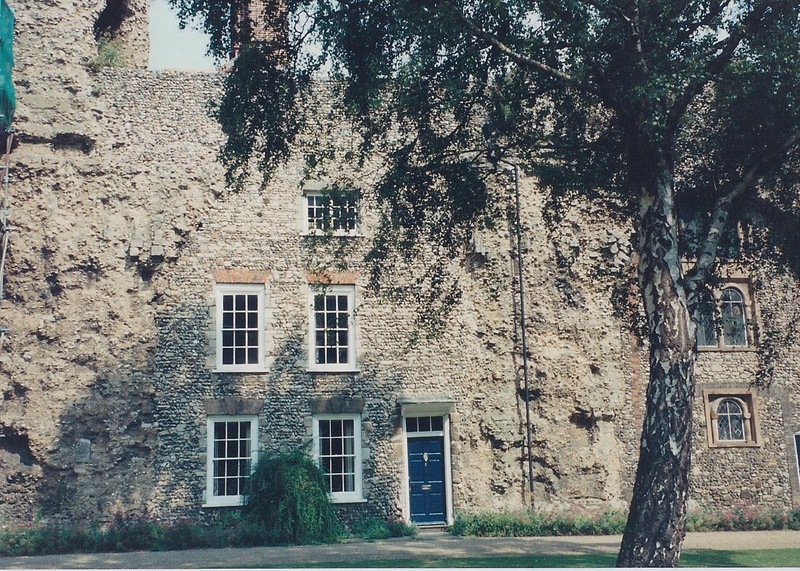 The first sight as you approach the monastery are “modern” houses built right into the side of the ruined Abbey. Remarkable! 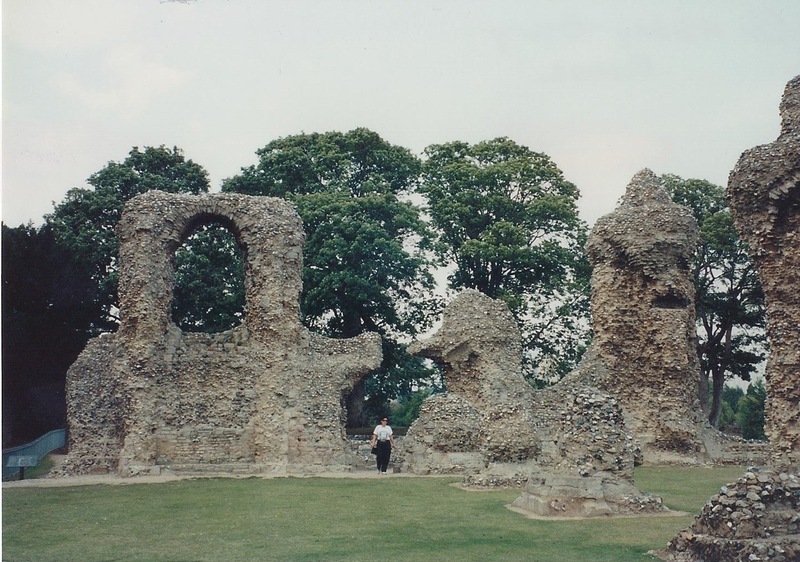 Abbey Church ruins, Bury St. Edmunds. Person for scale. It’s an unusual feeling, standing in the middle of these impressive ruins, wondering what it was like when the buildings were intact. Even today, you can get a good feeling for how massive they were-the monks must have felt the majesty of peoples’ monuments to their God and Church. On the last day of class, we had a busy day. In the morning, the class members who had written papers presented them to the class. 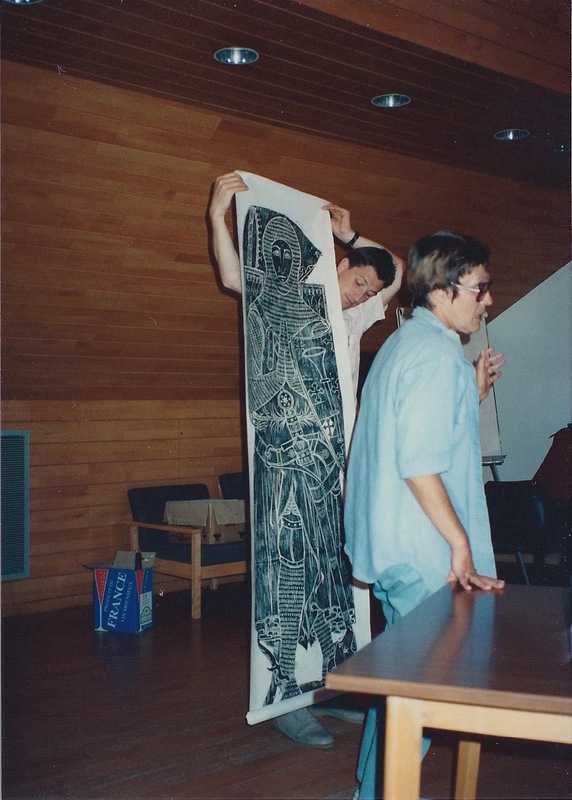 I gave a sort of lecture-demonstration about medieval music, playing some of it on the local “boom-box”-remember, this was 1991 and the CD hadn’t been invented yet! I was gratified that my classmates, and the professor enjoyed it. 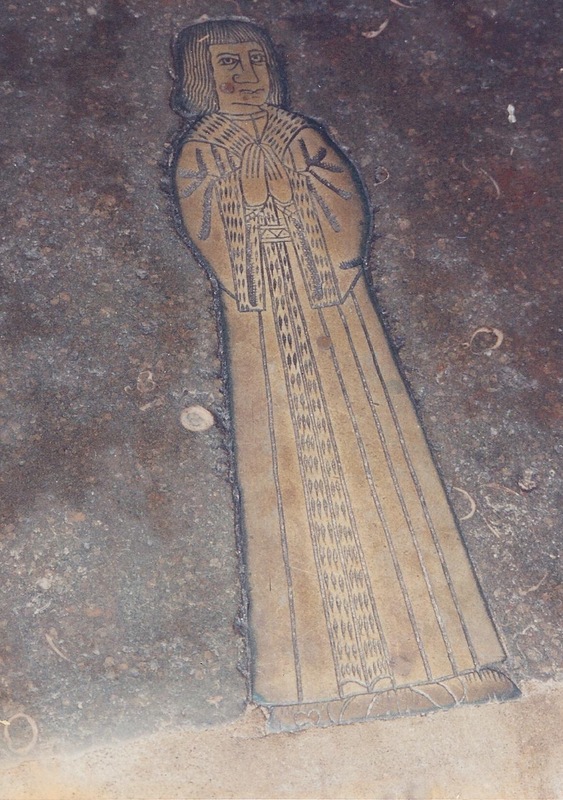 Doesn’t Dr. Bailey look sort of medieval in the way he’s holding the brass rubbing? She had to get special permission from the church to pull back their carpet and do that rubbing. That knight looks like he’s taller than she is! People in the medieval period were much shorter than we are today, due to their poor diets and bad or nonexistent sanitation. 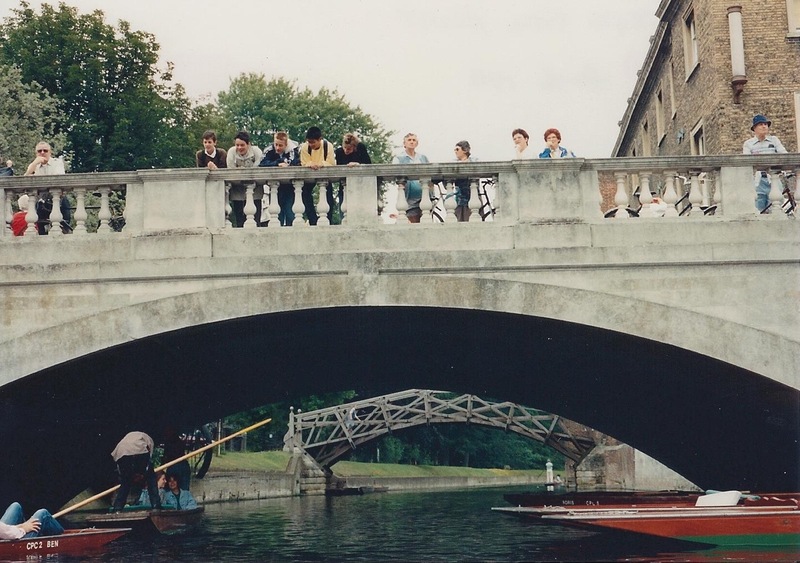 After the class was done, the whole group went punting on the River Cam, passing under the “Cam Bridge” that gave the city its name. We had lunch at a nice restaurant in town. It had been a magical three weeks, and I will always remember all the places we visited, and the fantastic view we got of how people lived 900 years ago. Dr. Bailey wrote a book from his thesis, on the agricultural economy in the medieval period, and I bought a copy to read on the flight home. 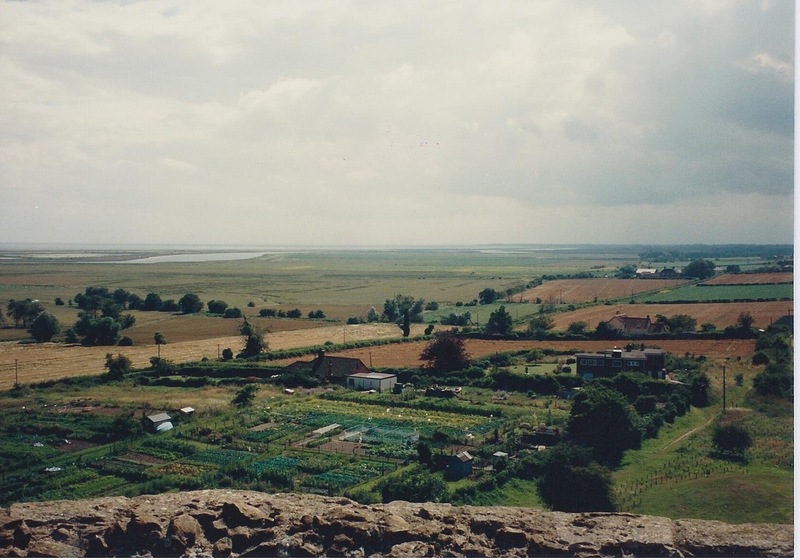 I found it fascinating, and he was convincing in his theory that, contrary to prior belief, the farmers in East Anglia in the middle ages made quite a good living from their fertile land, given what tools and crops they had to work with. I will always look back fondly on that trip. 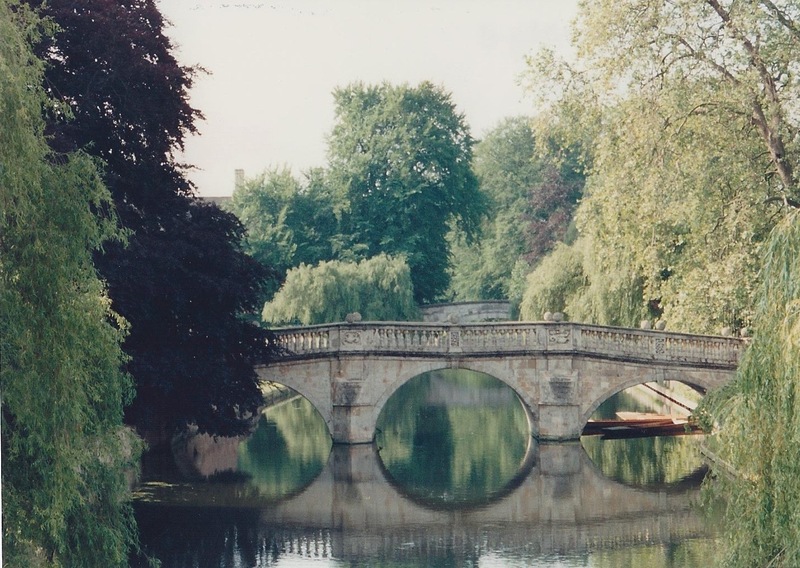 I think Cambridge is one of the most beautiful cities in the world. Go there some time, and see if you don’t agree. The massacre of over a hundred innocent French and other citizens was horrific, and expected. The enemy of Western Civilization has been invited in their thousands to Western Europe for decades. Islam, and Islamists will forever be the enemy of Western Civilization, until they are rooted out and destroyed. Chance of that happening any time soon? Less than zero. And that entity called the US president issues an inane statement about the perpetrators being “brought to justice”. No, stupid, it isn’t LAW ENFORCEMENT, it is WAR. 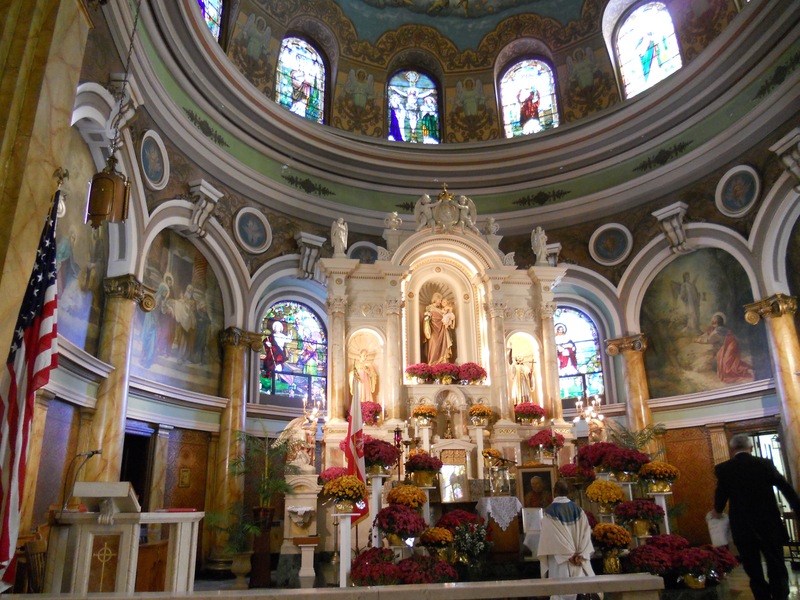 This is the sanctuary at St. Joseph’s Polish Catholic Church in Camden, New Jersey, during their 120th Anniversary celebration in 2012. The priest is Polish, and there is a Polish-language Mass daily. My husband grew up not far from here, and went to this church, and graduated from the parochial high school here (now defunct). Pretty ornate. 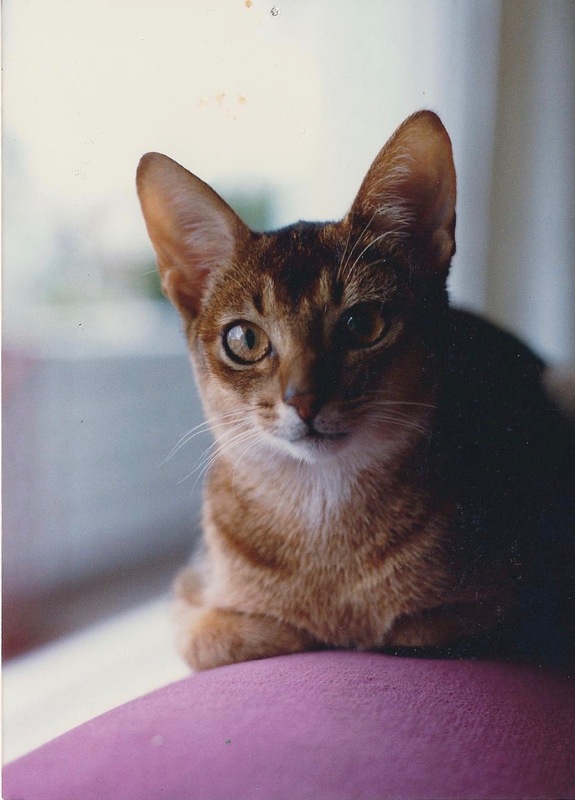 Once, in a previous life, I was owned by a purebred Ruddy Abyssinian cat, named Veloce. She was the only purebred cat I have ever had, and it was a treat, just to look at her. Please enjoy this visual treat, in honor of National Cat Day.